Sabbath, April 1st - Romans 4:8 - Blessed! Sabbath, April 22nd - Romans 8:1 - Don't You Know Who You Are? Sabbath, August 19th - Psalm 34:8 - Taste and See! Sabbath, Sept 30th - 1 Thessalonians 5:22 - What About Sin? This verse is rather striking: I cannot think of another instance where all three things happened at the same time - prayer, fasting, and laying on of hands. Ezra praying and fasting for a safe passage back to Jerusalem (Ezra 8:21-23). The apostles praying and laying on of hands to chose the seven in Acts 6:6. Prayer and laying on of hands to receive the Holy Spirit (Acts 8:17). When Saul’s sight was restored, Ananias laid his hands on Saul and told Saul what God had said; something like scales fell from Saul’s eyes (Acts 9:7). They received the Holy Spirit in Ephesus when hands were laid on - but implied in that is praying, I think (Acts 19:6). Esther asked that all the Jews fast for three days with her and her handmaids; no mention was made of praying (Esther 4:16). Daniel fasted and prayed for his people (Daniel 9:3). When Jacob blessed Ephraim and Manasseh, he crossed his hands as he laid them on their heads (Genesis 48:14). Even in my own life, I can think of very few times when all three occurred. We pray a lot. We lay hands on sometimes. We do not fast very often. So what was this event which caused the church to do all three? It was Saul (later to be called Paul) and Barnabas heading out on their first missionary journey. Yes! I definitely think this would be an occasion for beseeching God for His wisdom and guidance and strength and protection. But look at the verse just preceding this one: While they were worshiping the Lord and fasting, the Holy Spirit said, “Set apart for me Barnabas and Saul for the work to which I have called them.” (verse 2) This missionary journey was commissioned by God through the Holy Spirit! God may have given you a job, but it doesn’t mean it will be easy. God may have given you a job, but you still can’t accomplish it in your own strength. God may have given you a job, but you may not know exactly how to accomplish it; you still need His guidance. Prayer, fasting, and the laying on of hands are all ways of beseeching God for His mercy, involvement, and/or blessing in situations. We should never think that we’re going to change God’s will, but perhaps we can change God’s mind (think Moses, the Ninevites, Hezekiah) in a particular instance. But being able to petition God requires something else: a relationship with Him. If you want God’s guidance and blessing in your life, adding fasting and the laying on of hands is not going to make your prayers more powerful - not if you don’t already have a relationship with Him. Now is the time to draw near to God (James 4:8). Now is the time to focus on your relationship with Him. When you look at a fireman, how do you know he’s a fireman? He might be wearing his fire-fighting gear. He might be driving a fire truck. But usually, you know because he’s putting out fires. When you look at a teacher, how do you know she’s a teacher? Usually you know because she’s teaching. When you look at a farmer, how do you know he’s a farmer? When you look at a doctor, how do you know he’s a doctor? When you look at the governor, how do you know he’s the governor. You know because they are doing their job. You make a logical deduction that they are that person because of what they are doing. So how do you know that someone is a Christian? You see the evidence that they are a Christian because of the things that they are doing, just like the fireman or the teacher or the governor. You make a logical deduction that they are a Christian because of what they are doing. But just because someone puts on a fireman’s coat and starts fighting a fire doesn’t guarantee they are a fireman. Someone can stand up in front of a group of people and start speaking, but that doesn’t make them a teacher. Someone can sit behind a big desk in the capitol building, but that doesn’t make them the governor. The actions are just evidence, logical evidence, maybe even strong evidence that they who they are, but the actions don’t make them that person. So in Acts 15, the Jerusalem council is wondering what to do with all of the gentiles who were becoming Christians. There was a group of Jews, ones who believed in Jesus Christ, who were very adamant that these gentiles had to keep the whole law in order to be saved. They insisted that, if the gentiles, wanted to be Christians, they had to do all of these things. But actions are evidence of who you are in Christ. Actions don’t make you a Christian. In other words, your actions don’t save you. You don’t belong to Jesus Christ because of what you do. You belong to Jesus Christ because of what He has already done. Once you become a Christian, accepting Jesus as your Savior, your actions are important. They can be strong evidence that you are saved. But your actions don’t save you. This is what Peter stood up and told them all during the Jerusalem council. But we believe that we will be saved through the grace of the Lord Jesus, just as they will (Acts 15:11). The grace of our Lord Jesus Christ saves us. Sometimes we read right through Acts and we don’t stop to think of the implications in our own lives. That is, are we guilty of judging that people don’t belong to Jesus Christ because of their actions? The believing Jews, the ones who demanded circumcision and complete obedience to the law of Moses for salvation, were judging that the gentiles couldn’t possibly belong to Christ because of their actions. Do we do that? Do we look at others and think that they are not saved because of what they do? Yes, behaviors are strong evidence. But that’s all. They are just evidence, evidence from which we can draw a conclusion. But what if our deduction is wrong? What if God is drawing that person to Himself? What if God’s not done with them yet? Think about it this way. In my own heart, I know that I fail to live up to God’s standard. But I’m trying to live in a way that pleases Him, not because I want to earn my salvation, but because He is my God, He’s worthy of being given my utmost, He deserves the honor and glory of me bringing every thought into submission to Him. But when I fail, what if someone looked at me and said, “You’re not a Christian because you just did x y z.” My action, in that instance, is not the reality of my salvation. It’s evidence that I need to progress on the road of purification; but my salvation is not in danger because my salvation is not based on my actions, but on the actions of Jesus Christ. It’s a done deal. Thankfully, I have the privilege of repenting and restoring my relationship with God because Jesus ever lives to make intercession for me. My actions are an indication that I am saved, but they do not save me. At the end of the day, there’s another way to tell that someone is a fireman, or a teacher, or the governor: they get a paycheck. Similarly, there’s another way to tell that someone is a Christian: they will be in God’s kingdom; when Jesus Christ returns, He will gather those who belong to Him to Himself. I am very much looking forward to that day - because I am saved through the grace of the Lord Jesus. Do you ever find yourself reading through the Bible and not really thinking about what’s being said? When you stop to consider what’s in this verse, or actually this is just a portion of Acts 16:7, it’s amazing! First of all, this Paul’s second missionary journey. (This is where the Bible map is a great help!) The first missionary journey was to Antioch of Pisidia, Iconium, Lystra, and Derbe. The second missionary journey starts at Antioch, goes up through Paul’s hometown of Tarsus. Then he (and Silas) revisit Derbe, Lystra, Iconium, and Antioch of Pisidia. These churches which were planted on the first journey are revisited. It must have been a huge encouragement to Paul that what he and Barnabas had done on the first journey was bearing fruit. But when they left Antioch (of Pisidia), they were visiting places where they hadn’t been before. How would they know where to go and where not to go? We laugh at Yogi Berra saying, “When you come to a fork in the road, take it.” But when you want to go where God wants you to, how do you know what direction that is? When you are traveling, how do you know whether to turn right or left? It makes a difference. Robert Frost wrote, “Two roads diverged in a yellow wood, and I, I took the one less traveled by, and that has made all the difference.” Doesn’t God have a preference for where we go and what we do and the words we say? This verse in Acts 16:7 seems to indicate that God does care: . . . they attempted to go into Bithynia, but the Spirit of Jesus did not allow them (Acts 16:7, ESV). So if God cares, how does He let us know? This verse only tells us that the Spirit of Jesus did not allow Paul and Silas to go into Bithynia. It doesn’t tell us how! Let’s think about this for a minute. Traveling is not always easy. You can travel through bad weather. You can get blisters on your feet, if you’re walking. You can get a flat tire or a broken air conditioner if you’re traveling by car. You can hit road construction. There are any number of things which can slow you down when you’re traveling. But are those things which slow you down just part of living in this world? Are they stumbling blocks which Satan throws in your way because he doesn’t want you to serve God? Or is God leading you in a different direction? Think about this for a minute. There are too many stories which came out of September 11, 2001, about how people were delayed getting to work that morning. That delay, which initially was upsetting and irritating to them, actually ended up saving their lives - because they weren’t in the Twin Towers when the planes flew into them. Amy Grant sings, “A reckless car ran out of gas before it ran my way.” We don’t know how God arranges things to protect us, to guide us in a different direction, to move us to do or say what is His will, but we can’t automatically assume that what we initially thought was negative is actually negative! So the question remains: how do you know what God’s will is? When do you persevere? When do you go a different direction? Don’t you wish Luke had given us a few more details so we’d know how the Spirit of Jesus wouldn’t allow Paul and Silas to go to Bithynia? I can’t imagine that it was a literal wall, but we just aren’t told. So what do you do? First, we have to seek His will. That means praying and asking for His guidance. It means seeking Godly counsel from others. It means two people (Paul and Silas in this case) praying to God individually and together, and then coming to agreement on where to go. Sometimes we can’t agree on where to go, and we see that here too: Paul and Silas went one direction and Barnabas and Mark went another direction. So, we still have the question: how do you know God’s will? You pray. You read your Bible. You seek Godly counsel. You fast. In the end, you do the best you can. Someday, maybe, we’ll know which way we should have gone. And maybe someday we’ll get a chance to ask Paul and Silas how it was that the Spirit of Jesus wouldn’t allow them to go into Bithynia. The dentist office calls and leaves a message for your dad, asking him to come in thirty minutes earlier for his filling. You take the call, but you forget to tell your dad. He finds out three days after the appointment. Your mom’s friend calls just as your mom gets home. You say, “Oh Mom just got home. I’ll have her call you right back.” Your mom’s friend calls 45 minutes later, wondering if your mom got the message. Someone asks you to pray for them. You say, “I will pray for you.” Do you do it? You’re talking on the phone. The person says, “Tell your family I said, ‘hi.’” You hang up the phone and never mention the message. These all seem like little things, but what about not keeping your promises when they are big things? I remember a little girl whose dad would draw elaborate plans for bunk beds and desks in the cubbyhole underneath. She would get so excited. But it was all just talk. Her mom used to sing, “Heap big smoke, but no fire. Heap big smoke, but no fire. Him talk lot, but him not so hot. Heap big smoke, but no fire.” In other words, the person talked a lot, but you couldn’t depend on him. Do you know anyone like that? Are you like that? A more important question is: Does it matter to God? In Psalm 15, the psalmist asks who will dwell on God’s holy hill, who will be part of God’s kingdom. One of the characteristics listed is in verse 4: “who swears to his own hurt and does not change.” In other words, the person made a promise and they keep that promise even if it costs them! Psalm 50:14-15 says, "Offer to God a sacrifice of thanksgiving And pay your vows to the Most High; Call upon Me in the day of trouble; I shall rescue you, and you will honor Me.”… Part of God being your God is keeping your promises to Him. Deuteronomy 23:21 goes one step further: "When you make a vow to the LORD your God, you shall not delay to pay it, for it would be sin in you, and the LORD your God will surely require it of you.” It is a sin to not keep your promise to God. So look at the memory verse from Acts 23:14: They went to the chief priests and elders and said, “We have strictly bound ourselves by an oath to taste no food till we have killed Paul.” These Jews knew how God felt about keeping their vows. But God protected Paul and didn’t let them kill him. So what happened to them? Did they keep their vow? Did they starve to death because they hadn’t killed Paul? We’re not told. So that brings up the question: can you change your mind? Think about it. What if you promise God that you are going to kill someone - like these Jews wanting to kill Paul? If you come to your senses and are convicted that wanting to murder someone is not pleasing to God, what do you do about your vow? You repent of the vow. You repent of the intent to murder. You change your mind. And that’s what repenting is; repent literally means to stop what you’re doing and go in the opposite direction. You change your mind and your direction! Did you get that? Repenting is something we all have to do when we come to God and ask Jesus to save us from our sins. We repent of what we’ve done - literally we stop what we’ve done and turn completely away from it. That’s repenting. I doubt that these men starved themselves to death when they were foiled in their attempt to murder Paul. But I don’t know if they ever repented from wanting to murder him or even repented from making a vow before God. It’s an event which dramatically underlines how very important it is to be careful of our words and what we promise to others before God. God’s watching and listening. He knows whether “him talk lot, but him not so hot.” What we say matters and it says a lot to others about who we are. When I was a kid at the start of each school year, I’d hope that I’d do well in that grade. I hoped that I would make friends. I remembering hoping that I’d get a good part in the school play in fourth grade, and then hoping I wouldn’t mess up my lines or my solo the night of the play. When I got older, and we were moving to Iowa, I hoped I wouldn’t hate it too much. I hoped I’d make friends. I remember hoping, about this time, that God would find the perfect person for me to marry. I was thirteen. Paul expressed a hope to Felix, recorded in Acts 24:15. Paul said that he had “a hope in God . . . that there will be a resurrection of both the just and the unjust.” But this hope is different from most of my childhood hopes. I wished for things. I hoped they might come true. If push came to shove, I believed that I’d do well in school, that I’d make friends, that I’d do well in the play. But my hope was more of an expressed desire. It was wishful thinking, kind of like “I hope we have pizza tonight for supper.” It wasn’t the kind of hope Paul had. Paul’s hope was a belief so deep, a conviction so strong, that it changed the way he lived his life. Through faith in Jesus Christ, Paul’s hope was assurance. He knew that Jesus Christ will be coming back. He knew that everyone will give an account of his words and deeds. He knew that there will be a judgment day. Paul also believed that he himself would be saved from destruction through faith in Jesus the Messiah, His death and resurrection. This is God’s plan. This is not just what you’d like to see happen. This is not your plan, or Paul’s plan, for the future. This is the perfect plan of God. The “thing” actually happening doesn’t depend on you (or Paul). It depends on God the Father and Jesus Christ. Since They are sovereign, since we’re talking about God, we know They will do it. They will do exactly what They’ve planned. The resurrection of God also depends on God’s perfect character. Since God doesn’t lie, He can’t lie, you can absolutely depend on the promises of God. Jesus’ return and the resurrection depends completely on God doing what He says He will. You can absolutely depend upon God! When I was a kid, I hoped certain things would happen. But an interesting thing happened as each year passed: I learned that I had very little power to make the things I hoped for actually happen. Oh, I could be friendly to others - and hope to have friends. I could do my schoolwork and pay attention in class - and hope to do well in school. I could practice my lines for the school play - and hope I’d remember them under pressure. But the things I really hoped for, the ones I really wanted to happen, I had to trust that God would make those things happen. That meant I had to have a relationship with Him. I needed to ask for what I wanted and then wait for His timing. You remember the other thing I told you I hoped for, starting when I was about 13: the perfect person to marry? Praise God He answered that prayer. He fulfilled that hope. But it wasn’t right away. In fact, it was 13 additional years before that hope was realized and I married Ron. But I lived my life believing that God was going to show me who was the perfect person for me. I believed God would do it. But I had to wait for God to do it in His timing. Believing that there will be a resurrection of the just and the unjust is based on our hope in God, that it’s His plan, that He will accomplish it because He’s righteous and good. And believing in that resurrection, really believing in it, should change your life, how you live, what you do, what you say, where you go. Romans 12:10 - Love one another with brotherly affection. Outdo one another in showing honor. Philippians 1:27 - Only let your manner of life be worthy of the gospel of Christ. Colossians 1:10 - . . . Walk in a manner worthy of the Lord. Colossians 3:12-15 - Put on . . . compassionate hearts, kindness, humility, meekness, and patience, bearing with one another and . . . forgiving each other; . . . And above all these put on love, . . . And let the peace of Christ rule in your hearts, . .. And be thankful. 1 Thessalonians 4:11 - . . . aspire to live quietly, and to mind your own affairs, and to work with your hands. 1 Thessalonians 5:16-22 - Rejoice always, pray without ceasing, give thanks in all circumstances; for this is the will of God in Christ Jesus for you. Do not quench the Spirit. Do not despise prophecies, but test everything; hold fast what is good. Abstain from every form of evil. You know, maybe God hasn’t felt that a specific heavenly vision was necessary for each of us. We have been given direction, and a lot of it! I know I certainly don’t feel like I’ve done all of these things! “But!” you might say, “I don’t know exactly what this is supposed to look like in my life.” I don’t think Paul’s future was completely laid out before him when he was on the road to Damascus either. But Paul knew Who is in charge . . . and he had the leading of the Holy Spirit. Likewise, so does each Christian who commits his way to the Lord. How powerful the words of Paul were!! King Agrippa, the great-grandson of Herod the Great, seems to have felt the pull towards Christianity. And Luke, in recording the event, has captured the attention of so many other people as well. Based on this Biblical account, Phillip P. Bliss (well-known author/hymn-writer) wrote the words and music to this song, “Almost Persuaded,” published in 1871. In 1937, Billy Graham, attending a church service, heard “Just As I Am,” followed by “Almost Persuaded.” It was this second hymn which motivated him to give his life in service to Jesus Christ. Our job is not to decide who needs to hear the good news of Jesus Christ. Peter outlines our job this way, “ . . . but in your hearts honor Christ the Lord as holy, always being prepared to make a defense to anyone who asks you for a reason for the hope that is in you; yet do it with gentleness and respect . . .” (1 Peter 3:15, ESV). Who knows who might be drawn by the Father through the words that He gives us to speak. Don’t you hate it when someone says, “I told you so”? I’m sure there’s at least one person in your life who likes to say that to you at every opportunity. It’s frustrating because I feel like saying back, “You got lucky. You didn’t know it was going to happen that way.” I’m afraid there were way too many things that I did as a kid, that I shouldn’t have attempted, just because my older brother said, “You better not do that. This bad thing will happen if you do.” I always wanted to prove him wrong. And I always hated when he said, “I told you so” when I failed. I think about that feeling and then I read the whole story of Paul being taken, as a prisoner, to Rome. He didn’t have the freedom to not get on the ship. All he could do was tell the captain it was inadvisable, that he thought they’d likely lose the cargo, the ship, and their lives if they kept going. You see, it was wintertime and a very bad time to be sailing. Horrific storms blow over the Mediterranean. If the wind’s blowing against you, you can’t make any progress. Paul knew this. He could see what the weather trends had been. But the captain and owner of the ship disagreed with Paul, so they tried to continue traveling to Rome. It didn’t go well. A strong storm hit the ship. They started throwing everything overboard that they could to lighten the ship so it wouldn’t be swamped with water. Luke records that they lost all hope of being saved. So Paul stands up and says, “Men, you should have listened to me and not have set sail from Crete and incurred this injury and loss.” I wonder how many of them heard, “I told you so”? “Take heart” is one of those wonderful encouraging phrases. It’s the official notification that the speaker is going to tell you something good in the midst of the terrible things going on. In Paul’s case, it meant that after 14 days of being driven ahead of the storm, they were going to have to beach the ship, to run it aground. In doing so, they hit a reef and broke the ship to pieces. They’d already thrown all the cargo overboard. But thankfully, not one of the 276 persons on board ship lost his life. It was a terrible scene. They’d just been in the midst of a storm that lasted at least two weeks. They hadn’t been eating because it was so scary. They’d thrown all of the cargo overboard. The ship lay in pieces around them. . . . And yet, they all still had their lives. It reminds me of news reports of the aftermath of a tornado. The houses lay in piles of matchsticks, a hodge podge of ruined belongings and lumber. You can’t even tell what neighborhood you’re in. And yet, the people have escaped with their lives. Or the news reporter is standing outside a house that has burned to the ground. All the worldly possessions and family heirlooms are now just a pile of charred waste. And yet, everyone got out safely. They have escaped with their lives. There’s another place where the phrase “take heart” occurs. John 16:33 says, “I have said these things to you, that in me you may have peace. In the world you will have tribulation. But take heart; I have overcome the world.” There’s so much hope in that verse!! Yes, you are going to experience hard things. It’s part of living in this world. But we find peace when we have a relationship with Jesus Christ. And no matter how bad it gets, Jesus reminds us that He’s already won. He’s sovereign. We know how the story will end. If you belong to Jesus, you have a place prepared for you in His kingdom that will never end, a place where there will be no more crying or suffering or pain or death anymore. What an incredible hope that is!!! It seems like an overwhelming number of people are experiencing their own personal shipwreck right now. There’s lots of trouble in the world. You may have suffered a great loss, but you have this assurance, this blessed hope, to hold onto - if you know the Messiah, our Lord: He has overcome the world. So take heart. These two prayers were introduced to me when I was little. The first one was probably recited to me by a friend during a sleep-over. We were probably telling ghost stories or something equally scary. Why would I say that? Think about the words. Tim Hawkins talks about this prayer and how it is a frightening prayer to teach a child. Children are already afraid of the dark. Then, to make matters worse, this prayer talks about them dying?! The idea of placing our lives in God’s protective care isn’t the overwhelming impression left with young children! The second prayer was what our girl scout troop called the Johnny Appleseed prayer. It was the easy way for our troop to ask for a blessing on our food. I think we liked it because it simply thanked God for the things we needed - and no one person was singled out to say the prayer. But if these are the only prayers you say, then maybe you need to think a little more about your communication with God. It’s a prayer which starts by praising God. That’s always a good thing. Next, there’s a request that God’s kingdom come to this earth. We desperately need that! Following that, there’s a request for what we need for today, not tomorrow, not next week, just today. Then comes a request for forgiveness, based on how we have forgiven others. That’s not usually what people want. They want forgiveness, but they don’t really want to forgive other people. Next, there’s a request to keep us from the evil one - from the schemes of the devil. Finally, Jesus’ model prayer ends with an acknowledgment that God is sovereign and to Him belongs all things, all power, glory and honor forever. This is a really good outline for our daily talking with God. So . . . where does Paul’s prayer for the brethren, the saints in Rome, fit into Jesus model prayer? Well, maybe when you’re praying that God will provide for your needs today, maybe you can remember to also pray for the needs of your friend - because it says, “Give us this day our daily bread.” Maybe when you pray that God will protect you from the schemes of the devil, you can remember to pray that God will protect your sister or brother from Satan’s wiles too - because it says, “Deliver us from the evil one.” Maybe when you’re praying that God’s will be done, you can remember to pray that God’s perfect will be done in the heartbreaking situation in your friend’s family. Sometimes I think our prayers become too much about us. We want God to fix our problems, bail us out of the consequences of our bad choices, or keep us from making wrong choices. While it’s not wrong to pray those things, maybe our emphasis should be more on praising God, praying for His kingdom and His will in our lives - and praying for other people as much as (or more than) we pray for ourselves. Notice that nowhere in the Lord’s prayer is there an “I” or a “me.” It’s always “we” or “us.” We are a family of believers. We should be praying to reflect that reality! We should . . . without ceasing mention each other always in our prayers. I don’t think of using kindness when I want someone to change their behavior. I don’t think of sweetly explaining to them why they are in error. Rather, I want to yell, “Stop that!” or maybe “What do you think you’re doing?” I’ve been this way a long time. When the boys were little and Jennifer just barely saying a few words, there was a day when the boys were doing something I didn’t like. I didn’t sit in my chair and calmly and sweetly, kindly, tell them to stop what they were doing. Oh no! I took a deep breath . . . and then Jennifer looked at me and said, “Nice?” . . . and I let that breath out. I had intended to tell those boys in no uncertain terms what I thought of their behavior. But literally, out of the mouth of babes came some powerful wisdom. Nice. Kind. I wasn’t thinking nice or kind when I looked out of my bedroom window one day when I was still a teenager at home. I saw one of my brothers at the neighbor’s house with the neighbor’s boys kicking their geese in the seat of the pants, so to speak. When they made contact, the geese would squawk and fly into the air. The boys thought it was great fun. I stormed downstairs. Dad caught me and wanted to know where I was going. I told him I was going to go do that to the boys and see if they still thought it was funny! Dad didn’t think that was my job and sent me back to my room. Well, he was right. It wasn’t my job to make those boys stop tormenting the geese. Mom reminded me that I needed to be nice and she cited Proverbs 25:21-22: If your enemy is hungry, give him food to eat; And if he is thirsty, give him water to drink; For you will heap burning coals on his head, And the LORD will reward you. All I heard was that if I was nice, it would make him feel bad. I wanted him to feel bad. Only, you know what? It didn’t work that way. When I was nice to him, he thought that I was okay with his behavior. And I wasn’t! So then I was really frustrated. So then, here’s this verse: God’s kindness is meant to lead you to repentance. How does that work? First, God loved us while we were yet sinners (Romans 5:8) and gave His Son for us. That’s hard to get our minds wrapped around. While we were still in rebellion against Him, our carnal minds enmity towards Him, God still loved us enough to provide a way for us to be reconciled to Him! The Great God of the Universe thought enough of me to send His only beloved and begotten Son to die on the cross for me. Secondly, God is patient and long-suffering. Jeremiah records in Lamentation 3:22-23, “Because of the Lord’s great love we are not consumed, for his compassions never fail. They are new every morning; great is your faithfulness.” Peter states it this way: “The Lord is not slow to fulfill his promise as some count slowness, but is patient toward you, not wishing that any should perish, but that all should reach repentance” (2 Peter 3:9, ESV). And, God is merciful. When Moses asked God to show Himself to him, God passed by Moses and described Himself in these terms: “The LORD, the LORD, a God merciful and gracious, slow to anger, and abounding in steadfast love and faithfulness, keeping steadfast love for thousands, forgiving iniquity and transgression and sin, but who will by no means clear the guilty, visiting the iniquity of the fathers on the children and the children’s children, to the third and the fourth generation” (Exodus 34:6-7, ESV). Because God is good, because God is patient, because God is loving, He kindly works with each of us to draw us to Himself, to change our hearts, to mold us into profitable servants, to remake us into the image of His Son. God’s work in us is not done in a day, or a week, or a year. We spend our whole lives learning more of Him, becoming more like His Son, and bringing every one of our thoughts into submission to Jesus Christ. Praise God that He is patient with us. We make mistakes, but we can go to Him in repentance and find forgiveness through the blood of Jesus Christ. Praise God that He is loving and doesn’t send lightning bolts when we mess up. Praise God that He is merciful and doesn’t think more of the burning coals of fire heaped on our heads than the change in our hearts. I told you at the very beginning that my way of getting people to change their behavior is “right now” and it’s blunt, harsh, and demanding. Well, that’s true of who I was when I was a teenager. And that’s true of who I was when the kids were little. But as I’ve grown older and God has mercifully continued to draw me to Himself, I’d like to think I’ve become more gentle, more patient, and more loving. After all, that’s what God has shown to me - as He’s been changing me with His kindness. It’s very true: God’s kindness is meant to lead you to repentance. The first is “fall short.” It literally can mean “to be left behind in the race and so fail to reach the goal, to fall short of the end; to be inferior; to fail; or to be wanting.” It’s the same word that we see in Hebrews 11:37, “They were stoned, they were sawn in two, they were killed with the sword. They went about in skins of sheep and goats, destitute, afflicted, mistreated—“ It’s the word translated in this verse “destitute.” It means lacking everything or coming up short. It’s like running a race and being left behind by the rest of the runners, or running the race and not even being able to reach the finish line. The mental image this definition brings to mind is the warped wall in American Ninja Warrior. The contestant has to race up this curved wall fast enough to get enough momentum to vault himself up high enough to grab the top of the wall and pull himself up. Too many times the contestant falls just short of the goal - and he finds himself out of the competition. The second is “have sinned.” It’s the Greek word #264 which means to miss the mark, thus not qualified to share in the prize. Again, this word, which is translated so often as trespass or sin, has a rich word picture of a competition in which the contestant falls short or misses the mark. But it has an additional meaning of inherent consequence: not being qualified to share in the prize. So imagine that you’re in an archery competition and your arrow is nowhere near the target. You don’t even qualify for a prize because you have missed the mark or goal! Think of how great God is! He’s the Creator and Sustainer of everything. He’s our Savior and Redeemer. He’s our Provider, our Healer, our Defender, our Sovereign! God’s conversation wth Job starts with God asking, “Where were you when I laid the foundations of the earth” (Job 38:4), and then God continues with more humanly unanswerable questions. One of my favorites is, “Have you entered the storehouses of the snow, or have you seen the storehouses of the hail, which I have reserved for the time of trouble, for the day of battle and war?” (38:22-23). Our God is so absolutely, incredibly awesome! And us, His creation? In Ecclesiastes 5:2 Solomon wrote, “Be not rash with your mouth, nor let your heart be hasty to utter a word before God, for God is in heaven and you are on earth. Therefore let your words be few.” David said it very graphically, “I am a worm . . .” (Psalm 22:6). Isaiah wrote, “all our righteous deeds are like a polluted garment” (Isaiah 64:6). The contrast between who He is and who we are is enormous! Indeed, all have sinned and fall short of the glory of God. But I have good news. God is changing us. “And we all, with unveiled face, beholding the glory of the Lord, are being transformed into the same image from one degree of glory to another” (2 Corinthians 3:18). We are being changed into the image of Jesus Christ. There will come a time, because of God’s work in us, that we will share in the glory of God. Paul writes about the work God is doing in each of us: “For this light momentary affliction is preparing for us an eternal weight of glory beyond all comparison” (2 Cor 4:17). I can’t help thinking about all these things as we prepare for Passover. The Passover is so very special to those who love God, who recognize just how great God is, because it reminds us of how God made the way for us to be reconciled to Him! Jesus, the dearly beloved Son of our Heavenly Father, was crucified that our sins, our missing the mark, would be forgiven and so that we would have a chance to share in His glory. That’s hard to completely wrap our minds around! Passover’s just a little over two weeks away. It might be a good idea to spend some time thinking about this verse: all have sinned and fall short of the glory of God. And then think about God loving us, you and me, anyway. Do you know why there are traffic signs? It’s so that cars can get from one place to the other with as few accidents as possible. They remind drivers to slow down for curves. They let drivers know when it’s their turn at intersections. The traffic is supposed to flow - move from one place to another more easily and more quickly. But many people don’t like to obey the traffic signs. They drive too fast. They roll through stop signs. They pass in no-passing zones. They don’t yield to oncoming traffic. And sometimes they get away with it. But sometimes, there’s a penalty. Sometimes when you don’t yield to oncoming traffic, it causes an accident. Sometimes when you don’t yield, the driver who is supposed to be able to go first will shake his fist at the unyielding driver. And sometimes, a policeman just happens to be right there when you don’t obey the signs. That happened to me one beautiful August day. I was on my way to school - one of my most favorite days of the school year: a teacher work day when I could spend all day in my room getting it ready for a new crop of students. I was excited, and in a hurry, because I wanted to get to school. I didn’t come to a complete stop at a stop sign. I slowed down and kinda rolled through it. To my chagrin, there was a policeman also pulling up to that stop sign. He flashed his lights and pulled me over. It was, I think, something like a $80 fine. Kinda put a damper on my day. God’s laws are kinda like traffic laws. They are there for our benefit, to keep us from getting hurt, to help us get along well with others, and to make life work well. But sometimes we don’t like to obey God’s laws. We cut corners and hope that no one is watching so that we can get away with breaking them. Only, unlike the policemen who can’t be everywhere at once, God knows exactly when we don’t obey His laws. And we aren’t getting away with breaking them. Breaking God’s laws is called sin, and there will come a day when God will judge the whole world because of their sin. The payment for sin is death (Romans 6:23). That’s much worse than an $80 fine, and it will put more than a damper on a day. But there was another day when I was driving down the road and broke a traffic law. I was taking the kids to skating and was going 35 mph in a 20 mph zone. A policeman happened to be right there. He flashed his lights. I pulled over. My heart sank. But, he didn’t write out a ticket. He just gave me a warning. I deserved a ticket. I was speeding. But he, for whatever reason, decided to overlook my transgression. I didn’t have to pay the penalty for transgressing the law. So when Romans 4:8 says, “Blessed is the man against whom the Lord will not count his sin,” how does that work? Is it like what happened with the policeman just giving me a warning? No. Unfortunately, what happened with the policeman just makes the whole thing more confusing because he really didn’t do his job. His job is to enforce the law. I broke the law; he should have given me a ticket. Don’t get me wrong: I’m very grateful that he was willing to just give me a verbal warning, even if he didn’t have the authority to extend that kind of mercy. Because he’s a police officer, the just thing would have been to give me a ticket. God is always righteous. He always does the right thing, the just thing. So when His laws are broken, there is a penalty that must be paid. But God is also loving. So God provided a way for those penalties to be paid - in the crucifixion of His Beloved Son, Jesus Christ. Jesus died for the sins that you and I commit. When we break God’s law, we can ask for forgiveness. If we have a relationship with God, if we’ve accepted Jesus as our Savior, we are forgiven for our sin. We don’t pay the penalty - but Jesus did. The traffic laws of man are sometime very hard to honor. To come to a dead stop at a lonely 4-way in the middle of Iowa with nobody around seems like a waste of brake lining and gas. There are times when the laws of man just don’t fit the situation very well. Even though God’s laws are also often difficult to keep, they always fit our situations when properly understood. Because we belong to God, we are expected to learn His ways and to imitate Jesus Christ, who never broke God’s laws. We are, through obedience, to be conformed into the image of Jesus. When you sin against God, and ask for forgiveness, there’s an understanding that you don’t intend to keep breaking the same law. You are grateful for God’s mercy, for the sacrifice of Jesus Christ, and you don’t want to continue living in a way that is not pleasing to God. Jesus didn’t die so that people could trample all over a law that is intended for their good, the laws that keep them safe and help their relationship with God and with other people. On the contrary, the gratitude and love that we feel towards God for paying for our sin should be a huge motivator to do what He says from here on out. We should want to please Him. He has shown such love towards us; how do we repay Him? Passover is just around the corner. We’re going to be thinking and talking a lot about the sacrifice of Jesus on our behalf. But don’t just stop with what Jesus did. Consider what it means to you: blessed is the man against whom the Lord will not count his sin. Do you know how blessed you are? Are you ready to obey God’s laws? Have you ever wanted something just out of reach? Your arms were just too short. The goal was just out of reach. When you look around, there’s nothing to make you taller, except your older brother. Older brothers can be wonderful! My older brother rescued me more than once and if I’d needed help reaching something, he would have helped. What if you don’t have an older brother? Maybe you could borrow someone else’s. Perhaps your friend has a nice older brother who might be willing to help you out. That would be wonderful . . . as long as he was available when you needed help. But what if you weren’t particularly nice to your friend’s older brother? What if, every time you saw him, you hit him? Do you think he’d still help you? Jesus Christ is the only One who can help us reach the goal. What goal? The goal of eternal life in the kingdom of God. That goal is totally out of our reach. We all have sinned. We cannot, in any way, earn our salvation. We can’t get where we want to go. We are completely unable. But Jesus can, through His shed blood, His death, and resurrection, help us reach that goal. Our gracious Heavenly Father planned for Jesus to die and to be raised from the dead. It was our Father’s plan. It wasn’t an accident. It didn’t happen whenever. God planned for Jesus Christ to die, at the right time. Do you know what we call that time? Passover. Jesus Christ is our Passover Lamb. He died exactly at the right time, on the day that God’s people had been observing Passover for hundreds of years. They remembered the Passover event in Exodus when the Death Angel passed over the houses where the blood of the lamb was sprinkled on the doorposts and lintels. In a very similar way, Jesus’s death, the death of the Lamb of God, paid the price for our sins so that we wouldn't have to die. Remember our story of the friend’s older brother helping you reach the goal? Remember wondering if he’d help you even if you were not nice to him? That’s the truly amazing part of what Jesus Christ did. He died on the cross, for you and for me, while we were still sinners. We hadn’t repented of disobeying God. We hadn’t been sorry for doing what we want instead of what God wants. God’s ways didn’t matter to us. But Jesus died for us anyway. Romans 5:6 says He died for the ungodly. The ungodly are those people who fight against God, who disobey Him, who don’t listen to His commandments. Jesus died for them, for us, anyway. Oh, and that older brother part? Because we call God our Heavenly Father, Jesus Christ is our Older Brother. He is the One, the only One, who can lift us up to reach the goal. He is the One who died at the right time, on Passover. He is the One who died even though we were not nice to Him. Passover is coming up this week. I hope you spend some time thinking about your Older Brother. Do you know who Popeye is? He’s a cartoon character, a sailor, whose girlfriend’s name was Olive Oil. Do you know what Popeye was famous for? His strength. Do you know what made him strong? Eating spinach. What you eat can drastically affect your life! When I was little, I was always stubbing my toes and tripping over cracks. The ends of my big toes, my knees and my elbows were always skinned up. My older brother had a solution. He told Mom to feed me more carrots. Bob figured it must be an eyesight problem; I was falling and get hurt so much, he thought, because I couldn’t see well. He figured carrots were good for improving vision, and I definitely needed all the help I could get. There are similar beliefs, or sayings, about other foods - like “An apple a day keeps the doctor away.” That’s a belief that eating apples will keep you healthy so you don’t have to go to the doctor. Someone else joked, “An apple a day may keep the doctor away, but an onion a day keeps everyone away.” In other words, if you eat onions, your breath will be so bad that no one will want to come near you. So my question today is: Why do we eat unleavened bread? The first and most important reason is because God said to (Leviticus 23:6). Why would God command us to eat, every day, for seven days, what Deuteronomy 16:3 calls “the bread of affliction”? It’s supposed to remind us of the time when the Israelites left Egypt in haste - God rescued them from slavery and oppression in Egypt. But why would we want to remember what happened hundreds and hundreds of years ago in Egypt? It’s a physical example to help us understand what happens in our own lives. Before we have a relationship with God, we choose to do things that please ourselves. Many of those choices don't honor God. Romans 8:5 says “For those who live according to the flesh set their minds on the things of the flesh . . .” We aren’t thinking about the things that please God. In fact, Paul is pretty adamant, before we love God, we were slaves to sin (Rom. 6:20). We could not get ourselves free from sin. We were stuck. So when God rescued them from Egypt, He didn’t provide airplanes. He didn’t instantly transport them to their own country. No, the people had to walk. They grabbed what they could carry and they left Egypt in a hurry. In the same way, when we leave sin, we don’t look back. (Phil. 3:13) When God rescues us, we don’t want to continue doing what displeases Him. We want to get out of that immediately. We want to start making choices that honor God. The Israelites leaving Egypt didn’t have time to let their bread become leavened. They left in such a hurry that they just made unleavened bread. That’s why we eat unleavened bread - to remember how quickly they left Egypt, to remember that God rescued them from slavery, to remember those Passover events; as well as to remember our rescue from sin by the Passover Lamb, Jesus Christ. So God commands us to eat unleavened bread for seven days. We are to take into our bodies something that reminds us that we have been bought from sin, that we are no longer slaves to sin but that we belong to God. And that only makes sense. Jesus Christ is the Bread of Life (John 6:35). Jesus Christ never sinned (Hebrews 4:15). So the analogy can be made that during the Days of Unleavened Bread, we are eating unleavened bread to remind us to deliberately choose what pleases God, to choose to walk the way Jesus would, to bring Jesus into our lives as completely as we can. because it reminds us of how the Israelites were rescued from slavery in Egypt. because that teaches us of how we were rescued from slavery to sin by Jesus. because we know that Jesus Christ is the Bread of Life. because we know that Jesus was sinless; he was unleavened. because we want to take Jesus into our lives completely. We want to become like Him. There’s another saying about food: you are what you eat. There’s some truth to that, although the lady who swallowed a fly, didn’t turn into a fly. If you eat an onion, you don’t turn into an onion. But what you eat is broken down into nutrients that your body uses. If you don’t eat the right nutrients, your body doesn’t have the right nutrients to grow and be healthy. In the same way, we don’t become unleavened bread because that’s what we’re eating. And we don’t become Jesus Christ because we eat unleavened bread. But eating the unleavened bread reminds us to make Godly choices in our life, to choose the things that are pleasing to God, so that we can become more like Jesus Christ. We’ve been rescued, by God, from sin. We choose to walk worthy of the calling we’ve received. Eating unleavened bread is the reminder, for a week, that we choose Jesus’ way every day for the rest of our lives. Unleavened bread is better than onions at keeping sin away. Unleavened bread better than an apple for keeping you spiritually healthy. Unleavened bread is better than carrots for helping you to clearly see the way to walk in this world without stumbling. And unleavened bread is better than spinach for making you strong in the Lord. Don’t forget to eat unleavened bread each day this week! If you work for something, you expect to get a reward, to have some sort of payment for your work. If you do a worksheet correctly in school, you expect to get a sticker on your paper. If your neighbor hires you to mow their lawn, you expect he’ll give you money when you finish. If you work really hard, taking care of chickens, you expect that the hens will give you an egg or two. If you do what you are asked, you expect to get rewarded in some way. But every once in a while, someone gives you a gift - just because. They felt like it. No one forced them to give you a gift. You didn’t ask. They simply wanted to give you a gift. Now, what if you work really really hard . . . at being bad. Do you get rewarded for that? Well, yes, but we don’t call it “being rewarded.” We call it “receiving consequences” for our behavior. Some people say they’re getting what they deserve. For instance, if your mom tells you not to track mud into the house and you do it anyway, you’re going to receive a consequence. Depending upon your mom, you might have to clean up your mess, you might be grounded, you might be spanked, or maybe you receive all three consequences. Or if your dad tells you to go to bed and you don’t obey, you’re going to receive a consequence. It could happen that the next morning you might be really tired, and then you would get sick, and then you wouldn’t get to go to your best friends birthday party. Your dad doesn’t even have to ground you or spank you, you get a consequence from your disobedience whether he knows about it or not. Or . . . let’s say that your grandpa agrees to give you a penny for every potato bug that you pick off his plants. If you don’t pick any potato bugs off, you don’t get any pennies. Your wages, what you get paid, depends upon what you do. Do you know what sin is? Sin is being disobedient to God. You choose not to do what God says to do. There’s a consequence for being disobedient - a consequence that most people don’t like. If you sin, your consequence is death. That’s just the way it is! God created this world. It’s right and just that we should obey His laws if we want to live in His world! Have you ever sinned? Have you ever done anything that was disobedient to God? If you have, then what you deserve is death. And, according to God, everyone has sinned. (Romans 3:23; Romans 3:10; Psalm 14:3; Ecclesiastes 7:20) We all deserve punishment from God. His punishment for our sins is death. But God has given us a free gift in Jesus Christ. That’s what we’re celebrating this week of Unleavened Bread. God sent his son Jesus to die for us, because of our sins, so that we wouldn’t have to. If we accept that sacrifice for our sins, then we are forgiven. We are cleansed. That forgiveness is free. What Jesus did for us, in dying for us, is not something we can buy. We can’t earn forgiveness. And we can’t earn the free gift of eternal life! So does that mean we can live any way we want to?! Absolutely not! God has given us a gift. Why in the world would we ever want to displease Him by being disobedient? The gift of God is so great that we spend the rest of our life thanking Him, praising Him, doing what He says and loving Him by keeping His commandments. We can’t earn eternal life in His kingdom. That’s a free gift, but we can show Him how very much we appreciate what He has done for us. How much do you value what God has given you? Your willingness to please God shows how much you value His gift. As we continue celebrating the Days of Unleavened Bread, think about all the ways you can honor God with your life - to show Him how very much you appreciate the gift He has given you through the sacrifice and resurrection of Jesus Christ. So we’re at the end of the Days of Unleavened Bread. Did you goof up and eat and/or find any leavened bread this past week? Did you remember to eat unleavened bread each day? O.K. So now what? Do we just go back to our lives, go back to eating leavened bread, pizza and doughnuts? Did we learn anything this week that will change our lives going forward? Imagine that you’re in a room full of people. Your dad is sitting across the room from you and he’s calling you to come to him. Do you go straight to him? Or do you get side-tracked by someone enticing you with a candy bar? Do you see something that needs to be put away first? Does someone ask you to do something else first? Perhaps someone even grabs you as you go by, trying to detain you. Hopefully you have the respect for your dad that God commands so that you go directly to him regardless of any of the distractions. He has asked you to come to him; nothing else is more important than doing what your dad asks. It doesn’t matter that you don’t know why he has asked you to come; it should be enough that he has. If you come willingly, joyfully, you’re likely to get a big hug. You understand the analogy! Our Father has asked us to come to Him, to be in a closer relationship with Him through Jesus Christ our Lord. That’s why we’ve been eating unleavened bread. We’ve had a very physical object lesson every day this week of reminding ourselves to make Godly choices - avoid the leavening; choose the unleavened. So we start out on this path called life, towards our Father. But you know we can’t walk straight to Him. There are too many distractions along the way. Some distractions appeal to our desires - like chocolate. Some distractions appeal to our pride. Some distractions come from Satan, who know exactly which buttons to push to draw our attention away from the path we’re supposed to be on. No matter how hard something tries to draw you away, you must keep your mind focused on God. A closer relationship with Him is the goal. Some people try to do both: seek God and enjoy all the distractions. They figure that it doesn’t matter when they work on their relationship with God; He’ll always be there and there are so many fun things to do right here and now. The writer of Hebrews (4:6-11) tells us to listen to God’s voice today. If you hear His voice today, pay attention to it. God comes first. Isn’t that what Jesus said in the Sermon on the Mount? He said, “Seek first the kingdom of God and his righteousness” (Matthew 6:33). The reality is that none of us know how much time we have. We have to follow God first. We might not have time to get back on the path to doing His will and seeking a relationship with Him. And really, when you think about it, there is nothing in any of those distractions which can even come close to what God is offering us: a relationship with Him, a place in His kingdom, eternal life. I hope you’ve been thinking about these things this week. I hope you’ve chosen to obey God and you’ve eaten unleavened bread every day. I hope you always put God first. I hope you stay on the path! I’ve made some bad choices. I remember choosing not to keep my finger nails short my freshman year of high school. That was a bad choice. Gwen, our milk cow, let me know about it in no uncertain terms. I wore a hoof-shaped bruise in my midriff for a couple of weeks. I’ve made some mistakes. Christopher remembers the birthday cake that I made for him one year. It wouldn’t come out of the pan. I took it out in chunks and we had birthday mound instead of birthday cake. I’ve created problems that caused suffering. When I was a kid, I wasn’t sensitive to poison ivy. But my grandmother was. Once when we’d been playing outside in the trees, we’d gotten into some poison ivy. We came inside, not thinking anything of it, and sat down. Grandma later sat in that chair and she broke out in huge welts of poison ivy. What a problem I created! But Tenth Avenue North sings that I’m more than those choices. I’m more than the mistakes. I’m more than the problems I create. These things don’t define who I am anymore. Why? Because I’ve been remade. Remade? What does that mean? When I accepted Jesus Christ as my Savior, He took the penalty for my sins. But more than that, God gave me the gift of the Holy Spirit, to change me from my carnal nature with all of its bad choices and horrible mistakes and painful problems. I’m a new creature, being formed in the image of Jesus Christ (2 Corinthians 5:17). Because Jesus Christ bought me with His blood (1 Peter 1:18-19), because He died to pay the penalty for my sin, I am now free to make good choices, to avoid mistakes, and to prevent problems. Jesus Christ took me out of the miry clay and set my feet upon a rock (Psalm 40:2), the Rock, which is Jesus, where I am secure. As Casting Crowns sings, “Not because of who I am, but because of what You’ve done; not because of what I’ve done, but because of Who You are.” It’s not about me or what I’ve done. It’s all the work of God in me, creating a new creature to glorify Himself. So when Ten Avenue North sings, “Don’t you know who you are? And what’s been done for you,” our thoughts go to the Passover and the Days of Unleavened Bread, Jesus’ crucifixion and resurrection, and the hope that I have because of what He did for me. So I have one question to ask you: Don’t you know who you are, and what’s been done for you? Hostile to. At war with. Enmity against. Enemy. What does it mean to be an enemy to someone? You don’t want to be around them. You try to prove that you’re better than they are, show them little respect that they deserve. You put your desires before theirs. You try to hurt them and sabotage their goals. You try to influence others negatively against them. You dismiss their achievements as nothing, or give the credit for their achievements to someone else. You certainly wouldn't want to do anything they said. You are against them in every way that you can possibly be. So what’s the opposite of all these enemy behaviors? You want to be with them. You acknowledge their abilities and show them the respect they deserve. You put their desires first. You try to help them and work with them to do what they want to do. You say good things about them to others. You give them the credit for their achievements, acknowledging the value of what they’ve done. You try to please them by doing what pleases them. You are unified with them in every way that you can possibly be. So when Romans 8:7 says that “the mind that is set on the flesh is hostile to God,” you immediately ask yourself, “Am I an enemy of God, or, the opposite, am I friend of God?” So you have a list. Do you want to be with God or as far away from Him as possible? Do you acknowledge that He is the greatest or do you think you’re more important than God? Do you seek to do His will, or do you want Him to serve you? Do you work against God’s ways or do you try to serve Him? Do you give a good report about who God is to others or do you talk badly about God? This can also be seen in your behaviors. If you call yourself a Christian, but you don’t act very Christlike, you are making others think badly about God. Do you acknowledge that God is Sovereign; He’s the Creator; He’s our Redeemer? Or do you think that there are many ways to heaven, that we all got here by chance, and that maybe someone else is more powerful than God? Do you obey God or disobey Him? Are you following God’s ways, or are you going in the opposite direction? Romans 8:7 makes it very clear that if you are hostile to God, you will not obey God. Your attitude towards Him will be displayed in your behaviors. Similarly, if you love God with all of your heart, that attitude will be displayed in all of your behaviors. So, are you hostile to God and His ways or are you a friend of God? When my children were little, we started our school day by just reading through the Bible. When we got to Romans 12:10, Christopher read, “Love one another with brotherly affliction.” It was Jonathan’s snickering that gave him the first clue that maybe he’d read it incorrectly. Unfortunately, although we know Paul tells us to love one another with brotherly affection, sometimes our relationships with each other feel more like affliction than affection. So Paul emphasizes loving one another with brotherly affection with the next phrase: Outdo one another in showing honor. What does that look like? It’s not having to be the first in line: let others go first. It’s not picking the biggest and/or best strawberry out of the bowl: you offer it to others. You look for ways to serve, rather than always expecting others to serve you. You take advantage of opportunities to help someone else, to serve them. You are generous with your time and your resources. You think about the other person’s wants and needs instead of, or before, your own. All of these things are contrary to what we’re taught in this society. The culture around us says, “Me first. Take care of number one.” Even that’s unChristian because God is Number One, not you or me. Serving someone else, giving them honor and love instead of looking out for your interests first, that’s not fostered out in the world. There’s a song: Sister, let me be your servant. What’s the next line? Here’s the key to this whole discussion: Let me be as Christ to you. That’s the bottom line, isn’t it? We love one another with brotherly affection and outdo one another in showing honor because Christ came and gave us that example. He came as the suffering servant, coming to serve and to suffer for our sake. How can we not do the same to our brothers and sisters in Christ? Sister, let me be your servant; let me be as Christ to you. We are pilgrims on a journey; fellow travelers on the road. I will weep when you are weeping; when you laugh, I’ll laugh with you. I will share your joy and sorrow ’til we’ve seen this journey through. Brother, let me be your servant; let me be as Christ to you. We love others with brotherly affection. We show them honor. We look for opportunities to serve them because that’s the example Jesus gave for us to follow. But you can’t serve with an expectation that the one you’re serving is going to serve you back. They should. It should be a competition to see who can serve and show honor more. But even if it’s not, even if they just accept your service as their due, you still have honored God in being their servant, in honoring them. When Jennifer was little [She couldn’t have been more than two or three], I was trying to get her to learn to obey even when she didn’t want to. I gave her two M-n-Ms and told her to take them to Jonathan. Oh, she didn’t want to do it. She really just wanted to pop them into her mouth. It took quite a bit of encouragement to get her to walk across the room and hand them to Jonathan. But she did. When she got there, he graciously took them from her and thanked her. Then he gave her one back. I was trying to teach obedience. Jonathan was teaching brotherly affection. I can’t help thinking that God gives us the same opportunity. We obey God because we love Him. Just like Jennifer with the M-n-Ms, we do things our carnal nature doesn’t want to do because of the relationship we have with our Heavenly Father. I think our Father would be very pleased, when one of us has been obedient, when another one responds with brotherly affection. There’s the challenge: Love one another with brotherly affection. Outdo one another in showing honor (Romans 12:10). Once upon a time there was a paddling of ducklings in the middle of the pond. [A group of ducks is called a flock (if in flight), a raft, a brace, a team, or a paddling.] There were yellow ones and blue ones, and they were doing their best to follow their mama. There was another little duckling, a pink one, that wasn’t paying too much attention to the paddling of her brothers and sisters. She was keeping an eye on her mama duck but wasn’t paddling in the paddling. She wasn’t a team player on the duck team. So her brothers and sisters made fun of her. They joked about her odd color. They laughed about her method of paddling. They even poked fun at how she poked her head under the water for a yummy bite of whatever ducklings eat under water. And you know what? They were totally wrong in what they were doing. The duckling’s mama was keeping an eye on her. Mama duck knew the little duckling was safe. The little duckling was doing what she was supposed to be doing; she just wasn’t doing it with her brothers and sisters. They should not have been condemning her actions. Now if the little duckling had been robbing the grocery store, or had been lying about the neighboring geese in the next pond over, or had been disobedient to her mama, then the other ducklings would be right to make a judgment that her behavior was wrong. It is wrong to steal and to bear false witness and to be disobedient to parents. Nevertheless, it would be wrong for them to condemn the little duck and decide that she was never going to be of any value to anyone. But it’s important for all little ducks to make a judgment about behavior, what is right and what is wrong . . . and then make a decision to do what’s right. Isn’t it funny how we are so much like the little ducklings. We want everyone to paddle with us in our paddling. We want everyone to be a team player on our team - especially when it comes to something really important like worshiping God. We want everyone to do it our way . . . ‘cause then that would mean we are doing it the right way. If they’re doing it differently, sometimes, deep inside, we wonder if perhaps we’re not doing it right. Maybe we’re not paddling the way God wants us to. Maybe we’re not a good team player on God’s team. But there’s a difference between being disobedient to God and just being different. Not everyone has to like the same colors to be pleasing to God. (It doesn’t matter whether you paint the church walls white or cream - even though I know of a church which split over that!!) You don’t all have to be truck drivers, or garage door installers, or lawyers to be pleasing to God. (I had a high school guidance counselor who told me not to waste my life becoming a teacher even though I thought God wanted me to become a teacher.) You don’t all have to sing well during song service. (God just says to make a joyful noise, even if you can’t carry a tune in a bucket.) You don’t have to like everything that everyone brings for potluck. But you do need to be obedient to God. You need to keep the Sabbath. (Not everyone has to keep it with us, but they should honor the Sabbath day by keeping it holy somewhere.) You must not steal or lie or kill. These things are God’s law that you need to keep. So there’s a difference between being disobedient and just being different. And we all make judgments about the behaviors of the people around us. There’s a lot of freedom within the differences that we all have. It’s okay to be different and still be paddling in the same pond. It’s okay to be different in personal preferences and still be on the same team. We can make a judgment about a personal preference (one that’s not disobedient to God) and decide that we want to do likewise or that we would never do that! If God wants a person to go in a certain direction, He will lead him that way. That person is God’s servant. It’s really not our business if God wants him to live in Wyoming or become an astronaut. But when it comes to being disobedient to God, it’s a little different. We still make a judgment about the behavior, hopefully deciding that we don’t want to even consider being disobedient, but our response to the other person is different when we’re talking about sin. When it’s a personal preference we are tolerant. When it’s disobedience to God, we cannot be tolerant and just let it go. It’s not in that person’s best interest to ignore their disobedience; we’re not doing them any favors by tolerating their sinfulness. Our tolerance can lead them to believe that we are condoning their ungodly behavior. Our tolerance can make them think that God is pleased with their rationalizations and excuses. When we don’t say anything, we have, in effect, hidden our light; we are no longer an encouragement for that person to come to Christ. So we have to say something, if God presents the opportunity and prompting. But we can’t be like the little ducklings - harshly criticizing and condemning. We have to gently, lovingly correct - from the Bible. It’s not our opinion that we’re explaining to that person; it has to be the Word of God. And we show them God’s truth humbly because it’s only through the grace of God that we have come to see our own failings and sinfulness. We are all paddling on the same pond. We bear with one another’s idiosyncrasies because we have more than a few of our own. We exhort and encourage and correct one another because we want to please God. But we can’t spend our lives poking and judging and criticizing someone else’s personal preferences. That’s the exact opposite of exhorting and encouraging. My job is to keep my eyes on Jesus Christ. My job is to follow Him wherever He leads me. My job, if you will, is to keep my own ducks in a row. If I took you to a chicken house, what would you expect to find inside? A chicken - or two perhaps. If I took you to the monkey house at the zoo, what would you expect to find inside? Perhaps a monkey or an ape or an orangutan. If I took you to a fire station, what would you expect to find inside? No, not a fire! You’d expect to find a fire truck or a fire engine. If I took you to a school, what would you expect to find inside? Scholars. Students. Kids and teachers. So if I took you to God’s temple, what you expect to find inside? You would expect to find God there. 2 Chronicles 7: 2 calls the temple of the house of the LORD. Jesus called the temple “God’s house” (Mark 11:17). So you would expect that the temple is where God dwells. There have been some remarkable instances when God’s presence was evident in His house. Exodus 40:34-38 - When the tabernacle was completed, the glory of the LORD filled the tabernacle. No one, not even Moses could enter. However, God did tell Moses (and it’s recorded in Exodus 25:22) that God’s Presence would be over the mercy seat of the ark of the covenant between the outstretched wings of the cherubim in the Holy of Holies. The Presence of God was so tangible that Moses pleaded with God, “If your presence will not go with me, do not bring us up from here” (Exodus 33:15). Later at the dedication of Solomon’s temple, the glory of the LORD so filled the temple that, again, no one was able to enter, not even the priests (2 Chronicles 7:1-3). We’re not simply talking about a brightly shining light like the Sun; we’re talking about the Presence of the LORD - a spiritual essence that you could feel that came with fire. Later in Judah’s history, they strayed so far from a relationship with God that when God’s Presence left the temple, they didn’t even notice (Ezekiel 9:3; 10:4, 18; 11:23). So Paul’s assertion that believers are the temple of God and that God’s Spirit dwells in them would likely have evoked a strong mental image and remembrance of God’s Presence in the tabernacle and the subsequent temple. And it may have reminded them of the events on the first Pentecost following Jesus’ death and resurrection. Even if they hadn’t been in Jerusalem, they almost certainly would have heard the stories of the tongues of fire (Acts 2:3) coming to rest on believers and how the believers began to speak in tongues (Acts 2:4) and how people heard Peter’s message each in their own language (Acts 2:8). They might have remembered the presence of the Holy Spirit being so strong that 3000 souls repented and were baptized that day (Acts 2:41). They would’ve recalled Peter’s assertion to repent and be baptized for the remission of sins and that they would receive the gift of the Holy Spirit (Acts 2:38). Upon repentance of their sins, acceptance of Jesus as their Savior, and baptism, God would give them the Holy Spirit to dwell in them, to lead them into all truth, and to provide strength, comfort, and guidance. The idea of the Holy Spirit dwelling within a believer is a startling concept. But Paul couples it with the logical partner. Think about it. If God’s Presence, His glory, dwelled in the temple, and if the Holy Spirit now dwells within believers, what are the believers? They are the temple of God. Wow!! God’s temple! O.K. So what? How does that affect my behavior? God’s temple was dedicated to the service of God. If we have claimed Jesus as our Savior, then we have been bought with a price. We belong to God to do His service. The temple was where God met with the people (Exodus 29:43). As God’s temple, we become God’s hands and feet, His ambassadors, to the people around us, those people who desperately need a relationship with the Great God of the universe. We also comfort others with the comfort with which we ourselves have been comforted (2 Corinthians 1:4). It’s a huge event - that first Pentecost when the Holy Spirit was poured out on so many! The effects of that incredible gift reach farther than just our relationship with our God. The Holy Spirit dwelling within us also impacts the people around us - when we choose to let out light shine. And that’s an interesting thought too, isn’t it? Jesus told his disciples to let their light shine (Matthew 5:16). What light is that? Could it be that the presence of God, the Holy Spirit, God’s glory is the light we’re supposed to shine for others to see? If God’s Spirit dwells in you, then His Presence should be obvious in your life! People around you should have no doubt that you are the temple of God. That’s one of the lessons seen in the Day of Pentecost. You could put it in your pocket and take it with you. You could glue it on a barrette and put it in your hair. You could glue it on a paper clip for a fun bookmark. You could use it in a sling, like David did, for defense. You could use it to help build a road, so your car doesn’t sink in the mud. You could use it to help build a fence to keep your animals in. You could use it to help build the foundation on which to build your house. You could use it as part of building a house. For they drank from the spiritual Rock that followed them, and the Rock was Christ (1 Corinthians 10:4). God’s people didn’t drink the rock; they drank from the rock. Remember how Moses struck the rock and it brought forth water for them to drink (Exodus 17)? I don’t normally think about water coming from a rock, but the people were in the desert. They didn’t have water to drink. They were going to die without water. God told Moses to strike the rock and the water poured out of it. It’s a powerful reminder: that water coming out of the rock pointed to Jesus Christ, who provides the Living Water. We cannot live without Jesus. 1 Corinthians 10:4 is startling in another way. For they drank from the spiritual Rock that followed them, and the Rock was Christ. The Rock followed God’s people as they wandered in the wilderness? I don’t normally think about rocks following people. But the apostle Paul is painting a very vivid image in his readers’ minds: Jesus Christ is the Rock. Remember all of the things we use rocks for? He is our place of security - just like our house keeps us safe from heat and cold and storms. Jesus is our foundation - just like the foundation on which we build our house. If you try to build on sand, the house falls over when the storms come. In the same way, if you build your life on Jesus Christ, doing things His way, seeking to please Him, then your life won’t crash when the storms of life come your way. Jesus is our fortress or our fence. If your dog got out of the yard, he could be hit by a car. The fence keeps him safe. In the same way, when we obey what Jesus says to do, we are saved from all sorts of trouble and problems. Jesus is the way. Think about driving down the road. As long as you stay on the road, you’re not going to get stuck in the mud. But if you get off the road, you could find yourself going nowhere fast. In the same way, Jesus is the Way, and when we follow His leading we stay out of the muck and mire we would otherwise find ourselves in. Jesus is our defense. Just like David used a sling to defeat Goliath, we can look to Jesus to defend us against our foes. He is the God of angel armies. We know there is no one who can stand against Him. We don’t always know if God will protect us from trouble, but we know that He can. So we trust Him and praise Him, no matter what. Jesus should be very visible in our lives - like the paperclip or the barrette. People should never have to wonder if we are Christians. We should be displaying the kind of behavior that tells everyone that we serve the awesome God! I love that the apostle Paul told his readers that Jesus moved with His people. The people didn’t have to wonder if God was far away or close by. They knew He was right there with them, protecting them, providing for them, defending them, and showing them the way to walk. Do you remember the first thing I told you that you could do with a rock? Put it in your pocket and take it with you? You can’t put God in your pocket, but you can keep Him in your heart and in your thoughts. I hope that you love God so much that you would never even consider going somewhere He wouldn’t. I hope you take Him with you everywhere you go. So we don’t really want to sing all five verses of the song. We get it. There are lots of people who grumble. Maybe they have good reason to grumble . . . or do they? What are some synonyms for “grumbling”? How about “complaining” or “whining”? People who grumble are unhappy with what they have or where they find themselves. They are either unable or unwilling to do anything to change their situation, so they make sure everyone around them knows how unhappy they are. So what’s the opposite of “grumbling”? Thankfulness, gratitude, or appreciation. People who are thankful, who are appreciative for what they have or where they are, who show gratitude are much nicer people to be around. Think about it. Think about people who are complaining, criticizing, unhappy, grumblers. They don’t exactly feel you with warm, fuzzy feelings. Now think about people who are thankful, grateful and appreciative. They are the ones who make you want to do more for them. But it’s not really about how you feel about the grumblers or the thankful people. It’s really about how God feels about grumbling vs. thankful people. The Israelites, having just been rescued from Egypt, murmured and complained. They complained about lack of water and food. They complained about the enemies around them. When presented with the Promised Land, they refused to go in because of the giants in the land. But that was Old Testament; people don’t do that today! Really? The Psalms are full of admonitions to give thanks to God with a grateful heart. And this is not an optional encouragement. God takes our attitudes very seriously. Are we grateful for the abundance of all things, or are we grumbling because we think we deserve more? What we deserve is death! We’ve received mercy and incredible promises of adoption into His family! And we’re grumbling because we think we deserve more? Time to pray. Time to thank God. Time to praise God for the abundance of all things. Nope, no time to grumble here. I recently saw this verse demonstrated with a jar, a water balloon, a match, some tissue paper, and a straw. The jar is the world. We are the water balloon, sitting - as it were - on top of the world. The tissue paper, when lit on fire, is the temptation. The temptation is, of course, in the world - in the jar. 1) Place the water balloon (filled with water) on top of the jar. (Remember to moisten the top of the jar with water.) Notice how the temptation in the world isn’t pulling the balloon into the jar. But when the temptation heats up, things change rapidly. 2) Take the balloon off the jar. Light the tissue paper on fire, drop it into the jar. 3) Place the water balloon on top of the world. Make sure ahead of time that the balloon is large enough to sit on top of the jar without falling in due to gravity. The heat from the burning tissue paper causes the balloon to immediately get sucked into the jar. When you try to pull it out, the balloon will not come out. It’s stuck at the lip. In a similar way, we can be merrily walking along in life, avoiding the temptations in the world. We can even be flirting with fire because we haven’t yet succumbed to the temptation. If, suddenly, the temptation turns up the pressure on us, turns up the heat, we can be sucked into it before we even know what happened. It isn’t a slow process. It doesn’t happen gradually. The temptation grabs us. Then we’re stuck. Even if we want to get out of the situation, we cannot. So stick the straw into the jar and the balloon comes out easily. Our God is powerful and He can redeem us. He can rescue us from the disasters that we find ourselves in, due to our own choices, our disobedience to His ways. Succumbing to temptation is sin. Sin separates us from God and we don’t want to walk in this world without God. At least, if we’re wise, we don’t! Our goal is to please God with all of our lives. Our goal is not to walk as close to the line as possible. When you see a temptation, don’t flirt with it. Don’t try to get as close to it as possible without getting burned. Don’t sit there and wait to get sucked in. Do what Joseph did: flee! - two boxes with a “prize” in each, one box is wrapped; one is not. Several years ago my friend in Australia sent me a gift. It’s a little yellow fabric box, tied with a green fabric ribbon. On the bottom side of the box is a zipper. When you unzip the box and turn it inside out, it becomes a koala. Would any of you have guessed when you first saw the box that it would become a stuffed animal, a koala? Probably not. There were not enough clues for you to know that it would be - unless you’ve seen something like this before. So It’s really hard to judge what’s inside by just looking at the outside. I have two boxes. One is just a plain white box. The other box is nicely wrapped with wrapping paper and it has a pretty pink bow on it. What kinds of guesses would you make by looking at the boxes? You might guess that the plain box is for a guy because guys don’t care about wrapping paper. You might guess that the box wrapped in the pretty flower paper has a gift in it that would be best enjoyed by a little girl. You can make some guesses. But you don’t know. Even when you can see inside the container, you still don’t know for sure what’s inside. I have two spice containers. Both have a powered white substance inside. So you’ve probably made an educated guess that neither contains cinnamon or pepper or basil. But you can’t be absolutely sure what, exactly, the white substance is. You can see it, but you don’t know exactly what it’s characteristics are. What does it taste like? What does it do in water? What does it do to food? Even if I tell you that one is sugar and one is salt, you are still going to want to taste a tiny sample before sprinkling it on your food. With the koala box, the gift boxes, and the spice containers, the only information you can gather is with your eyes. And even though your eyes are really, really important in gathering information, they can’t give you all the information there is. That’s why God reminds us that we people can only look on the outward appearance of the people around us. We can only see what they do and what they look like. We can’t really see why they do certain things. We don’t know everything they’ve experienced that goes into who they are. Only God can look at the heart. That’s means you can’t judge them. You can’t say, “He looks really mean.” Maybe he had a flat tire on the way to church. You can’t say, “She doesn’t like me.” Maybe she’s frowning because she has a blister on her toe and her shoes hurt her feet. You can’t say, “He doesn’t care anything about what I say.” Maybe he walked past you when you were talking to him because he can’t hear you. So, when you meet someone new, it’s a really good thing to remember that you are only looking at the outside. When your brother (or sister) does something you don’t like, it’s a really good thing to remember that you don’t know why (necessarily). When you see someone at church, it’s a really good thing to remember that you don’t know what kind of day they’ve had. It’s your job to be gentle and kind and encouraging. Don’t decide that you know why someone is doing something just based on what you see. That’s like choosing a box just because of what’s on the outside. That’s like pouring salt on your strawberries because you don’t know which is the sugar. It’s like decided you don’t want to open your gift from Australia before you even know what it is. It’s like judging a book by its cover. I have a book here. It was one of my textbooks in college. It was an expensive textbook, but it was dated and not very useful. So I made it very useful. I cut away the insides of the pages, and now it holds candy - for people who didn’t judge the book by its cover and decide they weren’t interested in what is inside. Pour some water into a glass. What do you hear? Anything? Nope. That water is pretty quiet. When you are sure things couldn’t get any worse, we often refer to that as night. And when things are really, really bad, we say that is the darkest part of the night. Have you ever heard your mom tell you to go get a good night’s sleep, that things will look better in the morning? That’s because we feel a correlation between the dark, the nighttime, and things not going well. And that’s not a new concept. Three different psalms talk about God giving songs in the night (42:8; 77:6; 149:5). But is it the same song to everyone? Think about the different glasses. They are all different shapes and different thicknesses. So they vibrate differently. But they all vibrate when you run your finger over them. So it is with us: God knows what each of us needs to be encouraged. (Kinda reminds you of a song: “I have a song that Jesus gave me.”) Sometimes it’s a hymn from church; for the longest time, I sang “Come, Thou Fount of Every Blessing, tune my heart to sing Thy praise.” When I was thinking of this sabbath lesson, I thought of the song, “A Song in the Night” - “’til the whole world has heard of the soon-coming King, a song in the night I’ll sing.” Sometimes God gives encouragement when you suddenly remember a verse that you memorized. One of my favorites is “For these light and momentary troubles are achieving for us a glory that far outweighs them all” (2 Corinthians 4:17). Sometimes God provides encouragement when a friend calls you on the phone, or sends you a text, just to talk to you for a moment. So the glasses can look differently - just as we are all different one from another. But we are all encouraged by God - if we remember to go to Him and ask for that encouragement. And He’ll bring to mind how many reasons to sing praises to Him? 10,000 Reasons!! There’s one other cool thing to show you with the glasses. What happens to the pitch when I add more water? The pitch gets lower. When God fills our hearts with hope and encouragement, we settle down to a more solid position of praise. I would encourage each one of you to think of your favorite verse and your favorite song - a verse and a song that you can sing when you need to remember that God is the One who can save you from any trouble. Remember the story of Paul and Silas in prison. They started singing praises to God at midnight. And He rescued them! (Acts 16:25) So sometimes God rescues us. But sometimes we sing songs at night, like Jesus did the night before he was crucified (Matthew 26:30), because God gives you the song to strengthen you to go through the hard times. When you’re playing a xylophone, there are some notes that sound good together and some that don’t. The octaves sound good. The thirds and fifths sound good. The seconds, sevenths, and fourths - well, we kinda want to avoid the sounds like that. Unity would be like playing the same note or perhaps octaves. But we’re not always completely unified. We are all so different, with different likes and different backgrounds. And, as long as it’s not against God’s word, difference can be good. It’s okay if you like blue and he likes red and she likes green. Those are preferences which make us different from each other. That’s kind of like playing a third or a fifth on the xylophone. They complement each other. Those differences make life more interesting. It could be boring if everyone thought Chevy was the best kind of car or if everyone thought Ford was the best. Differences can be good. But differences can also cause problems. Let’s say that you like quiet when you’re trying to do your schoolwork, and your little sister wants to sing her way through the day. Neither one of those preferences is against God’s law, but the way that you react towards each other because of those differences could say a lot about whether you truly love God or not. When there’s a difference of opinion, you have to find a way to reach a compromise; that’s what is pleasing to God. And we can see that demonstrated on the xylophone. If we play the first line of “Joyful, Joyful We Adore Thee,” it sounds good to us. But if we take the chords one at a time, we realize the song is made up of some pretty discordant notes - which are resolved to more pleasing chords. Think about this for a moment: the music we listen to, and like, is a combination of notes played together, pleasing to displeasing which resolve back to pleasing. Think of how good it feels when you’ve had a disagreement with your best friend and you work it out. Your relationship was discordant, but you worked it to a more pleasing state. Your parents are very happy when bickering sisters and brothers figure out how to live more peaceably. Similarly, how pleasing it must be to God when we hit a snag in our relationships with the people around us (discordant) and then we work to resolve the problem. Sometimes you have to stand your ground when there’s a disagreement. Those are the times when you are choosing to do what is pleasing to God rather than what is pleasing to the person with whom you have a conflict. God’s ways always come first. But that’s not what this verse is talking about. Psalm 133:1 is talking about learning to get along with the people around you who truly love God like you do. A few of the translations substitute “harmony” for “unity.” How good and pleasant it is when brothers live together in harmony! (Holman Christian Standard Bible) I like that translation. Because of my love for music, I understand how harmony is so much more pleasing than disharmony. But music also teaches me that, in this life, we’re going to have a little of both. The key is to always come back to harmony. Have you ever thought about eating these food items by themselves? How about a big spoonful of flour? A big bite of shredded zucchini? A slither of raw egg? A slurp of oil? Too much? How about a little spoonful of baking soda or baking powder? Or cinnamon? Even vanilla by itself wouldn’t be all that appealing? The only thing you’d consider voluntarily sitting down and scarfing down might be the sugar, but only if your mom isn’t watching. So what if we mix all these food items together? Now who wants a big spoonful of zucchini yuck, I mean, bread dough? It still doesn’t look very appetizing and you probably wouldn’t eat very much of it, would you? So how about we bake it? You’d probably like a slice of warm zucchini bread, wouldn’t you? Isn’t that just like life? Your life is made up of all kinds of events. Some of them you really like - like sugar. Some of them you could tolerate - like maybe a spoonful of flour. But some of the things that happen in your life are not fun. You wouldn’t choose to have your life made up of them - like baking powder or raw eggs. And like the mixed up zucchini dough, your life is a combination of events. You don’t get to just spend all of your life at Six Flags. Like too much sugar, you’d soon be sick. You don’t have to spend all of your life doing schoolwork, but it is good for you - like the zucchini. There’s one other really cool analogy with our zucchini mess. It’s not desireable until it has some heat applied. In the same way, God prepares you to be used by Him by applying some heat to your life - like refrigerators going out or people you thought were friends not being friendly at all (as in, “With friends like you, who needs enemies?”) In other words, you experience some heat, some stress, some trouble. Sometimes people, the ones who really love God, call it discipline from the Lord. The apostle Paul puts it this way: And we know that for those who love God all things work together for good, for those who are called according to his purpose (Romans 8:28). So if you really love God and God has a plan for your life, then all those good parts of your life, and all of the okay parts of your life, and even the yucky parts of your life are all mixed up to produce something very pleasing to Him. That’s a good thing to remember when life, metaphorically, hands you a raw egg to eat. If I gave you a pebble, would you describe it as large or small? What if I asked you to put it in your shoe and walk across the room? Does that pebble now feel small or large? What if I gave you a small paintbrush and asked you to paint your name on a 3 x 5 index card - would that paintbrush be large or small? What if I poured a small glass of water for you - would it make a difference about whether you thought it was big or small if I asked you to drink it or if I asked you to pour in on your lap? So much of the time, how we see things depends a lot on how we experience those things. Weeding a garden doesn’t seem like a huge task . . . . unless you’re the one doing it. Ice doesn’t seem all that cold on a hot August day . . . but it does in January. Our perception, how we see things, also depends on what else is around. For instance, a rock might seem really big . . . until you see a bigger one. That same rock might seem really small until you pick up a pebble. A paint brush that seemed really big becomes really small next to a larger one. And a toddler seems enormous next to a newborn. Our perception of things, then, depends on comparing them to other things and it depends on our experience of them. And so many people go through life relying solely on their perspective. They compare things one to another and they experience things, classifying things as good or bad, better or worse, as they go. Is that the only way to view situations and experiences? What if there’s another way to see things. What if we had God’s perspective? What if this huge problem (like a big rock) is really not even important in God’s perspective? After all, He’s sovereign and He can use that “problem” for your good. What if this little choice (like a pebble) that you don’t think is a big deal at all actually ends up changing the course of your life? We would probably find ourselves in less stressful situations, in less trouble, and having fewer health problems if we could just see things from God’s perspective and live our lives accordingly. The good news is that we can read the Bible and know what God’s perspective is for many areas of our lives. Some little action that we didn’t think really matters could actually be defined as sin - and therefore something that will negatively affect our lives. We wouldn’t know that though, if we weren’t reading God’s word. God’s word, the Bible, gives us God’s perspective - defined by the law. Sometimes we read the Bible and don’t see how it applies to us. That’s where God’s Holy Spirit comes in. Jesus said the Holy Spirit would guide us into all truth (John 16:13). Our way of perceiving things (by comparing or by experiencing) gives us a way of evaluating that is limited. We don’t know everything. We don’t understand how everything fits together. We don’t always see from God’s perspective. How different, how much better, our perspective would be if we could see all things the way God sees them. 1. Combine water, oil, salt, cream of tartar, and food coloring in a saucepan and heat until warm. 3. Stir, then knead until smooth. The cream of tartar makes this dough last 6 months or longer, so resist the temptation to omit this ingredient if you don't have it on hand. 4. Store this dough in an airtight container or a Ziploc freezer bag. I started with water, oil, salt, cream of tartar, food coloring, and flour. Once I mixed it all together, added some heat, and kneaded it, I had some fun playdough from which to make things. I could make a pot. Or I could make a bird. Or I could make an elephant. Well, someone could take the clay and make it look like an elephant. And that’s the beauty of clay: if I don’t like what it looks like, I can smush it and start over again. God is the Potter. He’s our Father. We are the clay, the work of His hands. Does He have the right to change our shape? Yes. He’s the One Who made us. He not only took the ingredients and formed them into a human being, He also created the ingredients. He started from nothing and spoke us into being, by His will, for His pleasure (Revelation 4:11). So He has the right to mold us into anything He desires. God loves you - loves you so much that He gave His only begotten Son for your sins. But God didn’t stop there! Having paid for you with the precious blood of Jesus Christ, God began a good work in you. A good work! Not a mediocre work, not a passable work, but a good work! And He will continue working in you - and that work will be revealed when Jesus returns. So although you know this means God is going to continue to smush you, molding you for His glory, you know that you can trust Him because He’s good and because He loves you. And you know that all the changing is for your good. He wants you to be formed into the image of Jesus Christ and He has plans for you in His kingdom. Try to remember that the next time you’re feeling bent out of shape and smushed. Imagine you had a whole display of yummy-looking food items spread out before you. What would you do? You’d taste them, of course. Your mouth would start watering at the thought of how good they look. Your tummy might start rumbling, signaling its approval of sampling the culinary delights. Your eyes would quickly assess which of your choices you’d select first. But. Just because all of these things look good doesn’t mean that you will particularly like how they taste. My older brother, for example, made a delectable-looking lemon meringue pie one time. But he misread the recipe and used 1/4 cup of salt in the meringue, instead of sugar. We couldn’t eat it, no matter how good it looked. In the above scenario, you’re tasting to see if the food is good. But that’s not what Psalm 34:8 says. It says, “Oh, taste and see that the LORD is good! Blessed is the man who takes refuge in him!” The emphasis changes completely when you substitute “if” and “that.” The psalmist isn’t telling you to taste and see if you think God is good. The psalmist is flat-out telling you that God is good - statement of fact. Then he emphasizes this fact by stating, “Blessed is the man who takes refuge in him!” Good things happen when you trust in our good God. So you might ask, “How is God good? What makes Him good?” Here’s God’s description of Himself: “The LORD, the LORD, a God merciful and gracious, slow to anger, and abounding in steadfast love and faithfulness,” (Exodus 34:6) This description is repeated by David in Psalm 86:15 and Psalm 103:8; by Nehemiah in 9:17; and by Joel in 2:13. The LORD - Jehovah - the I AM - the Cause without a cause, the self-existent One - the personal God of Abraham, Isaac, and Jacob - He is full of mercy; He is full of grace; He is so patient with us; He loves us so much that He was willing to die for our sins while we were still sinners; and He is faithful. This is the God who created us and redeemed us from our sin. He is merciful and gracious, slow to anger, and abounding in steadfast love and faithfulness. This is how He was to David, to Abraham, Isaac, and Jacob and this is how He is to us today. God doesn’t change (Numbers 23:19; Malachi 3:6; James 1:17). He is the same yesterday, today, and forever (Hebrews 13:8). God is good all the time. You might taste different foods to see if they are good. But when you have a relationship with God and come to know Him, you’ll find out that He is good - all the time. If you hold a balloon (air-filled) too close to the flame of a candle, what will happen? Yes, it will pop. The heat of the fire doesn’t dissipate from the focal point before the balloon melts. But what happens if you hold a balloon filled with water the same distance from the flame of the candle? The water does not allow the balloon surface to get hot enough to melt. The water dissipates the heat away from the focal point. You can even hold the balloon until the water starts boiling and the balloon still will not pop. This happens because of water’s large heat capacity. Liquid water can take in and give off huge quantities of heat. Because of this quality, life is possible on earth. Water moderates the temperatures on Earth. In contrast, on the Moon, temperatures swing from daytime highs of 200ºF and nighttime lows of -200ºF. Water is the only chemical found at earth temperatures in the three states: solid (ice), liquid, and gas (humidity or water vapor). All three forms are necessary for the Earth to be healthy and function. It’s no wonder then that water is used as a metaphor for both the Holy Spirit and Eternal Life. Think of John 7:37-39 - the Water Ceremony during the Feast of Tabernacles: On the last day of the feast, the great day, Jesus stood up and cried out, “If anyone thirsts, let him come to me and drink. Whoever believes in me, as the Scripture has said, ‘Out of his heart will flow rivers of living water.’” Now this he said about the Spirit, whom those who believed in him were to receive, for as yet the Spirit had not been given, because Jesus was not yet glorified. There are so many verses which refer to water. Think of the Samaritan woman at the well in John 4, when Jesus told her that if she asked, he would give her living water. Think of the desert wilderness blooming at the return of the Lord (Isaiah 35 - the whole chapter is a beautiful promise of the joy of the redeemed). Think of the water coming from the rock when it was struck at Horeb for the Israelites in the wilderness (Exodus 17:6) - an incredible type of the Holy Spirit flowing from Jesus when He became the Savior for sinners lost in the wilderness of sin. Without the indwelling of the Holy Spirit, we will not be in God’s kingdom. (The Holy Spirit testifies with our spirit that we are the children and heirs of God. Romans 8:16-17) Without water within the balloon, it perishes. The water saves the balloon - aka, keeps it from popping. Water, the living water from Jesus Christ, gives life to these mortal bodies. John said in Revelation 22:17b, And let the one who is thirsty come; let the one who desires take the water of life without price. Are you thirsty for the living water of God? Activity: Play follow the leader. Explain the rules: whatever the leader does, everyone else in line has to do. I plan to weave my way through our church fellowship, shaking a hand here, hopping three times, giving a hug there, turning in place, giving a quick back rub, touching my toes, asking someone how they are, etc. Eventually we will make our way back to our starting point. How willing were you to do everything the leader did? Why were you willing to comply or unwilling to follow? Think about being a Christian. Who are you supposed to follow? You are supposed to follow Jesus Christ. But there are a lot of people out there who would like to convince you that you should follow them. Paul’s statement in 1 Corinthians 11:1 indicates that it’s okay to imitate, to follow someone else’s lead . . . as long as they are following Jesus Christ. Sometimes Christians are willing to follow a leader because their friends are. As long as I could convince one of the children to follow me, I was likely to get all of them. But it would only take one child who was reluctant to follow to derail the whole activity. So why would a child be reluctant? We’re doing this activity in front of the whole group. They’re the center of attention. People might laugh. We’re a lot more willing to make ourselves vulnerable to people laughing at us if we’re not the only ones laughed at. The children might not have wanted to play along because they didn’t think it was right. Perhaps they would consider “Follow the Leader” to be an inappropriate game to play at church. Ah! That gets to the heart of this verse in 1 Corinthians 11:1. We, as social creatures, have a tendency to follow the crowd. It looks like fun. Our friends are doing it. We’re willing to take a risk. But the first question we should always ask is: would it please God? Would it bring glory and honor to Him? If the answer is yes, then we shouldn’t worry about whether it’s fun, or whether our friends are doing it, or whether we’ll be laughed at. If what we’re considering is pleasing to God, then we should be more than willing to engage! So the next question is: How do we know it’s pleasing to God or not? That’s where we need to make sure we have a relationship with God - based on prayer, Bible study, fellowship with like believers, meditation. If we’re not reading God’s word, we’re going to have a hard time knowing what He says is pleasing to Him. And it’s going to be very hard to know if the person we’re following is doing what is pleasing to God. So how could we imitate someone else, not knowing if they were actually imitating Jesus Christ? The more time we spend in His word, the more time we spend seeking Him, asking for His guidance, the more we’ll truly be able to discern what is pleasing to Him. We could talk about associated analogies and variations on the theme, but it boils down to this: we don’t follow someone simply because it’s fun or because everyone’s doing it or because we’re worried about other people’s opinions. We follow someone only if they are following Christ. That means we have to know what Jesus did. In reality, He’s the One, the only One, we should follow all the time. When might you need a shield? If someone is attacking you, you could use your shield to defend yourself. Your shield could deflect marshmallows or beans or wads of paper. But what if you took a paper shield outside for protection during a snowball fight? How well do you think that would work? Or what if someone were shooting arrows or flaming arrows at you? A paper shield wouldn’t be too effective at that point! It wouldn’t be much protection from a sword or a bullet either! When you stop to think about it, there are a lot of things with which you could be attacked. A good shield, a strong shield, would be a good thing to have. So let’s say that you are being bombarded behind your shield. What do you do? You duck behind the shield? You crouch down and hide as much as you can behind that shield. So then . . . . what do you do when the battle is over and your foe has been vanquished? You are the victor. So you come out from behind the shield with your head up. The battle is over. You are the winner. That’s the imagery in Psalm 3:3: But you, O LORD, are a shield about me, my glory, and the lifter of my head. God is our very strong shield. Is there anything that can harm us when God is our shield? No! Not a chance! God is the best protection that there is. Not only does He protect me, He also gives me the victory. He is my glory. (Psalm 62:7; Jeremiah 9:24) And because he gives me the victory through our Lord Jesus Christ, He’s the One who lifts my head. You’re a soldier of the cross. You’re in the Lord’s army. Because you’re a soldier of the cross, you’re going to have to fight. You should expect some battles in your life as you serve God. God can protect you. He is sovereign. But you shouldn’t expect to receive honor if you’re not fighting for God. That is, if you’re not engaging the enemy under orders from your Lord, you shouldn’t expect His protection. Soldiers rarely win every battle. Sometimes you win some; sometimes you lose some. Your chances of winning are greatly diminished if you’re not following orders from your Commanding Officer. If you’re not fighting for God, you’re fighting against God - and that’s a losing proposition. We know the end of the story. God wins. So even if the battles in your life feel like defeats, even if you fight to the death (without seeing the victory), we know that God wins in the end. God’s kingdom will be established. As long as you are fighting on His side, you can rest assured that He will lift your head in His kingdom. You will see victory in His kingdom. To not be fighting on God’s side is to be fighting a losing war, to be fighting with an inferior shield, to be assured of defeat. Our victory is in Christ! As I have been walking the dogs in the mornings, I’ve been watching the leaves on the shrubs and trees. Do you know what they’re doing? They’re changing color! The hackberries are a brilliant yellow, the winged sumac are a vivid red, and yet, the oaks maintain their dark greens. Why are some of the trees and shrubs changing color? It has to do with the amount of sunlight that the plants receive. When the sunlight starts to lose its intensity, the leaves don’t make as much chlorophyll. It’s the chlorophyll which gives the leaves their green color. So when the green color is no longer dominant, other colors start to show up - like the reds and yellows and oranges. So why is the sunlight less intense? That has to do with the revolution of the earth around the Sun. The path, or orbit, of the earth around the Sun is not a perfect circle. It’s more of an oval, or an elliptical path. In addition, the Earth is not perfectly vertical; it’s tilted at 23.5º on its axis. You also need to know that the Earth doesn’t wobble - like a gyroscope. The Earth maintains that degree of tilt even as it rotates each day on its circuit around the Sun. When the direct rays of the sun hit the Northern Hemisphere, the Northern Hemisphere enjoys longer days, warmer temperatures - summer. When the Southern Hemisphere has the direct rays of the sun, they get to enjoy summer, while we in the Northern Hemisphere enjoy winter. When the most direct rays are over the Equator, that’s when we begin either spring or fall. During our summer, we have the most direct rays, longer days, and the warmest temperatures of the whole year. This is when plants grow really well and lots of chlorophyll is produced in the plants. But once Earth reaches the point on its path (its orbit) around the Sun when the Sun’s rays are most direct - the longest day of the year, then the days start to slowly get shorter. Little by little, we notice that the temperatures aren’t quite so warm. Since the leaves don’t have the intensity of sunlight to make the same amounts of chlorophyll, the leaves more and more lose their greenness; they start showing the reds and oranges and yellows. We say that the leaves are changing color. We say that the seasons are changing. And it’s possible that this is what the second half of Exodus 34:22 (NAS) is talking about: You shall celebrate the Feast of Weeks, that is, the first fruits of the wheat harvest, and the Feast of Ingathering at the turn of the year. We celebrate the Feast of Tabernacles (here called the Feast of Ingathering) at the time of year when the leaves are changing, the seasons are changing, when the Earth has passed the point on its orbit (called the Autumnal Equinox), moving it towards winter and the shortest days of the year for the Northern Hemisphere. 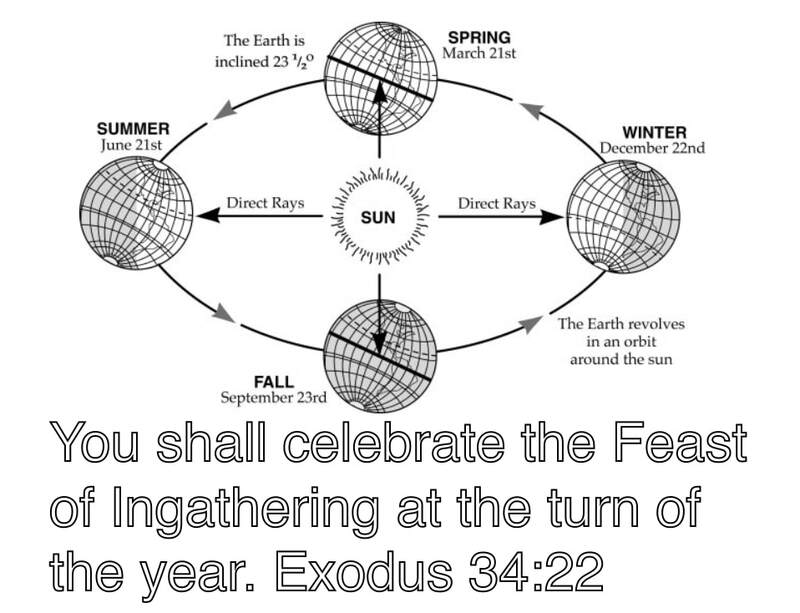 It’s also very interesting that Exodus 34:22 calls the Feast of Tabernacles “the Feast of Ingathering.” It’s the time of year when the harvest has been gathered in (Deut. 16:13; Exodus 23:16; Leviticus 23:39). The harvest happens once the intensity of the sunlight has decreased enough to cause changes in the plants because the growing season is drawing to a close. All of the scientific reasons for the plant changes is fascinating. It shows intelligent design by our Creator who made the universe and all that is in it. But when I look at the turning leaves, I don’t spend a lot of time thinking about the tilt, the autumnal equinox, and the decrease of chlorophyll. The leaves are another reminder of God’s calendar and His holy days!! The Feast of Tabernacles is coming!! You can see it in the leaves. Have you ever been to a surprise birthday party - you know, the kind where everyone hides and then you jump out and yell surprise when the person having the birthday walks in? Sometimes they are truly surprised. Sometimes they have an idea that something is coming. Have you ever been waiting for someone special to come to your house? You’ve thoroughly cleaned the house and picked up your room. You’ve made special things to eat. Then you wait for that person to arrive. What do you do when they get there? You maybe run out to their car to greet them, to give them a big hug, and to help them carry in whatever they may have brought with them. In both of these situations, there’s preparation. There’s some waiting - because you don’t know exactly when the person will arrive. And there’s a lot of noise and excitement when they do come. Even if you knew that someone was going to leave the room and come back with a surprise for you, you would be ready to make some noise when they came back in. That’s part of the picture of this day - Trumpets. It is a sabbath when you do no work. It is a day of holy convocation - meaning we assemble to worship God. But it is set apart from every other of God’s holy days by this command: it is a memorial of shouting. We are to remember to shout. Jericho - (Joshua 6) - The children of Israel were commanded to march around Jericho, silently, once for six days. On the seventh day, they marched seven times and then gave a great shout. The walls fell down flat and God gave the Israelites the victory. Gideon - (Judges 7) - Gideon took 300 men to conquer the Midianites. They surrounded the camp at night, each with a trumpet and a torch in a jar. At Gideon’s signal, they all broke their jars to let the light shine, they blew their trumpets, and they yelled, “A sword for the LORD and for Gideon.” God gave them a great victory that night over their enemies. 1 Thessalonians 4:16 - When Jesus Christ comes back to set up His kingdom on this earth, “the Lord himself will descend from heaven with a cry of command [a loud shout, yom teruach], with the voice of an archangel, and with the sound of the trumpet of God. In the case of Jericho and Gideon, the trumpet and the shout was directly connected to God giving them the victory. In the same way, when Jesus comes back, there will be a loud shout and the sound of the trumpet of God. We will be victorious over sin and death forever! This is the picture in Revelation 11:15: “Then the seventh angel blew his trumpet, and there were loud voices in heaven, saying, ‘The kingdom of the world has become the kingdom of our Lord and of his Christ, and he shall reign forever and ever.’ ” This is the central phrase in one of the most recognizable of all classical works: “The Hallelujah Chorus” from Handel’s Messiah. And it truly is the time when we all will be shouting “hallelujah” because Jesus Christ has returned! That’s why we’re all here today. It is a memorial of a day yet to come when Jesus will return and set up His kingdom, when He will set all things right! Keep your eyes open. Get ready. Be prepared. Be ready to shout! What do you do when you are faced with sin? You can stand your ground and try to fight it. You can succumb to the sin. Or you can get as far away from the sin as fast as you can. You already know that succumbing to sin is not good. Sin separates us from God. He is holy. He is not going to contaminate Himself with something unholy. If we want fellowship with God (and you’d be foolish not to want fellowship with God), then we want to avoid succumbing to sin. We don’t want to impair that relationship. You can stand your ground and try to fight sin. The problem is that Satan is depicted as a roaring lion, seeking whom he may devour. He’s a crafty, intelligent being who knows how to make wrong look like it’s right. He knows how to disguise things. He knows how to manipulate us so that we find ourselves in a huge mess before we even realized it was coming. The only way to fight sin and Satan is through God’s power - and God isn’t going to fight sin while standing in the middle of it. So, your third choice is to get away from sin as quickly as possible. It’s the reaction of Joseph to Potiphar’s wife in Genesis 39. When she wanted him to sin, he first told her no. When she wouldn’t listen, he fled. He left so fast that he left his cloak in her hands. That a good model to follow. It’s okay to protest - to immediately make a profession that you don’t want anything to do with sin or evil. But if the situation doesn’t resolve right away, you can’t stay in it! Think about the beautifully colored carnations (or celery stalks). You know they don’t grow that color. When they’re cut, the stems are placed in a vase of colored water. The color travels with the water up the stem to the petals (or celery leaves). Those white petals begin showing more and more of the color the longer they’re left in the colored water. In the same way, the longer we stay in sin, the more we are affected by it in our lives. Immediately, there’s a distance from God. Then there are all the natural consequences of sin and ungodliness. The more you sin, the more natural consequences there are. In the end, the best choice - when faced with sin - is to get away from it as quickly as you can. You don’t want anything that is anti-God. You don’t want to impair your relationship with God. You don’t want to suffer pain and discomfort from sinful choices. So you get away from sin and evil as quickly as you can. Get yourself out of the situation. Demonstration: In a clear pie plate filled halfway with water, sprinkle some pepper. In this analogy, the water is your life; you are the pepper; the dish soap is sin. Drop a couple of drops into the pie plate. The pepper shoots to the edge of the pie plate (because the surface tension of the water has been broken by the soap). Similarly, when sin comes into contact with your life, you get away from it as quickly as you can. Let’s say a project needs a slice of paper 4 inches by 11 inches long. You can guess where to make your cut, or you can measure four inches carefully. If you measure a little too wide or a little too narrow, you may have to start all over again. The problem is, you won’t know if you’ve cut too little or two much until you are halfway through the project. Starting over again means that you’ve lost all that time. If you had measured twice, you could have cut once and known that it was right. Here’s another demonstration about hurrying. we’d be more likely to have the desired outcome in the least amount of time. What Solomon says in this proverb is that being hasty often results in poverty. When you don’t take the time to do things right, you end up losing money. Since this proverb, and many of the proverbs, is written in parallel style, the opposite of hurry is diligence. Be thoughtful. Consider your ways - and you’re likely to be prosperous. However, if we only rely on our own intelligence and strength, we can still find ourselves having to start over on projects or having to retrace our steps from having gone the wrong way - wasting time. It’s always a good idea to ask God for His direction in our lives, praying that He’ll open or close doors and show us the path He wants us to take. We should be willing to listen to counsel from people who love God and are good counselors. We need to spend time thinking about our actions. It’s better not to live our lives like chickens running around with our heads cut off . . . or dancing raisins. ​Source: Science and the Bible, 30 Scientific Demonstrations Illustrating Scriptural Truth, Donald B. DeYoung, 1997, pg. 35. Do you know how far some butterflies migrate each year? Some Monarch butterflies travel 2,000 miles! Do you know how far some hummingbirds migrate each year? Some travel 1,300 miles - 500 miles across the Gulf of Mexico in 18-22 hours!! Some eagles migrate from Northern Canada to northern Mexico each fall. That’s about 3000 miles. A stream of migrating eagles can be 20 - 30 miles long and half a mile wide, with the birds averaging about 30 miles an hour. They can travel as much as 225 miles a day. How can they go that far? They depend on the wind. If there’s no wind, the eagles can’t soar. So when there’s no wind, eagles stay put or only travel locally. Eagles take advantage of wind currents. They find a thermal - a column of rising warm air. Once the warm air carries the eagles really high, they glide until they find another column to take them up again. Imagine how exhausted a butterfly or a hummingbird or an eagle would be if they didn’t have the wind helping them travel!! In a similar way, when you belong to God, He gives you the support that you need in order to endure troubles and problems. It doesn’t mean that you don’t have to do anything. You can’t give up when faced with difficulty. You can’t just sit back and do nothing. God expects you to stay the course, to fight the good fight, to persevere to the end. But He also promises to help you - to renew your strength, to mount up with wings like eagles, to run and not be weary, to walk and not faint. It’s like a ping pong ball. The ping pong ball can fly through the air when hit or thrown. It can roll along the floor. It can bounce. But it cannot hope to lift itself up - not any more than you can pull yourself up by your bootstraps. But just like the air dryer can support the ping pong ball, God can give you the strength and determination, the courage and the hope to persevere in following Him and serving Him with all your heart! Problems don’t go away, but God promises that we don’t have to go through them alone. We don’t have to find the strength on our own to endure. We can trust Him. We need to trust Him. He promises never to leave us or forsake us. But we can lose God’s support if we decide we’re not going to walk in His ways. Here’s where the support is - in this stream of air. If we place the ball outside of that support, the ball will fall. If we try to live our lives outside of God’s support - outside of His ways, we’re going to find ourselves without the strength to persevere and succeed. Why would we want to live without God’s Spirit helping us in our lives? It would be so foolish! So stay close to God. Read your Bible every day. Talk to God every day in prayer. Go to church. Think about God and what He wants you to do in every situation. Trust God. Wait upon Him. Concept from: Science and the Bible: 30 Scientific Demonstrations Illustrating Scriptural Truths, Donald B. DeYoung, “Floating on Air,” Baker Books, 1994, pg. 52-54. If I hold a quarter over a cup and let go of it, what will happen? The quarter will fall into the cup. Why? Because of the law of gravity. If I place the quarter on a card over the cup and pull the card out quickly, what will happen? The quarter will still fall into the cup. Why? Because of Newton’s First Law of Motion (otherwise known as inertia) and the law of gravity. Newton’s First Law of Motion says that an object in motion will remain in motion, or an object at rest will remain at rest, unless acted upon by an outside force. What kind of outside force could act upon that quarter so that it wouldn’t fall into the cup? Hmm. If I pull the card slowly sideways, the quarter will stay with the card and will not fall into the cup. Why? Because the law of friction, the adhesion between the molecules of the card and the molecules of the quarter, will cause the quarter to move with the card. The law of friction is the outside force which overcomes inertia. O.K. So how does this work in your life? Let’s say you have a jar of candy in your house. The law from your parents is that you can have a piece when you get permission from them. One day when your mom is busy, you look at that candy jar. You know you’re not supposed to get into the candy, but you really want a piece. That’s the law which is at work in your mind - your overwhelming desire for a piece of candy. Just like that quarter falling into the jar, unless you have some outside force at work, you are going to be drawn to that candy. Is there an outside force which will keep you from getting into the candy? Maybe it is enough to know that you’re really going to be in trouble when your mom finds out. Maybe the fear of being found out will be enough. Or maybe you don’t want your mom to be disappointed in you. Maybe that outside force will be enough. If that outside force (like the friction on the quarter) is not enough, you will get into the candy (just like the quarter will fall into the jar). In Biblical terms, the quarter dropping into the jar is your natural inclination - what you are going to do, how you will react to things around you. You are born with a carnal nature. The choices you make are based on that carnal nature. You don’t necessarily think about your choices, but even if you do realize that you’re making choices that displease God, you can’t seem to help yourself - just like the quarter is going to drop into the jar. The apostle Paul says that your carnal mind is enmity against God. You are going to choose the wrong way, even if you know you shouldn’t. So what’s the outside force which will keep you from making ungodly decisions? It’s God working in us. It’s God’s Holy Spirit which changes us. We no longer want to make choices that are displeasing to God. And, if we listen to that leading, it becomes the force which keeps us from listening to our carnal nature and doing things which are displeasing to God (like the friction on the card which keeps the quarter from falling into the jar). Newton’s second law of motion states that acceleration is equal to the force exerted on an object divided by the mass of that object. It could also be stated that the force needed to move an object depends on acceleration times the mass of the object. In simple terms, the bigger an object is, the more effort you are going to have to exert in order to move it. If you have a little rock and you want to move it across a table, you can simply flick it with your finger. If you have a big rock, flicking it with your finger is not going to do anything but make you stick your finger in your mouth. You might actually have to give the rock a pretty good shove to get it to move across the table. If you have a huge boulder, you will have to brace yourself, put your back into the effort, and then you’re still probably not going to be able to move it one iota! So how does this relate to a Biblical principle? Well, think of it this way: we all make mistakes. We all sin. Our sin puts us out of fellowship with God, because God does not sin; He has no fellowship with sin. To restore the relationship with God, we need to repent. That means telling God that we are sorry for what we have done and resolving not to do it again. It literally means changing your mind. So if you change your mind about wanting to do something, your actions should follow those thoughts. Our actions demonstrate what we think. In any case, when we ask for God’s forgiveness, He tells us that He is faithful to forgive us (1 John 1:9). That sounds simple, doesn’t it? For whatever reason we don’t ask for forgiveness, the amount of sin just continues to grow. Pretty soon, instead of a small rock of sin that can be flicked away, now we have a large rock of sin. It takes more effort to repent because it’s harder to walk away from something that has become a habit. It’s like a drip of paint. If it’s one drip of paint and I get to it right away, I can almost make the paper look brand new. That’s like the person who does something wrong (sins), and then goes to God in repentance right away. But if I let that drip of paint dry and continue to drip on my paper and let that paint dry, it’s really hard to make the paper look like it’s brand new. That’s what it feels like to the person who has made it a habit to sin. That habit has become so strong, it’s really hard to repent, to ask for God’s forgiveness. You can see it is always best to deal with the mistake, the paint, the sin, as quickly as possible. We want fellowship with God. He’s our Savior. He’s our Help in time of need. He’s our Shield. He’s our Shepherd. We need Him guiding, directing, protecting, providing! That’s why Isaiah 30:15 is so beautiful! When we turn from our sinfulness and rest in Jesus Christ, we are saved, saved from sin, saved from isolation from God, saved from more and more bad choices. We want the relationship with our Great God, to trust quietly in Him. That’s where we find strength. Materials: rubber band, bouncy ball, green bean seeds, mirror, printed verses (James 1:17; Romans 8:32; Psalm 9:1; Psalm 95:2-3; 1 Chronicles 16:34; Psalm 100:4. Imagine I pull a rubber band back from my index finger. What will happen when I let go? It will fly forward. If I pull harder and farther, the faster and farther the rubber band will fly when I release it. This is an example of Isaac Newton’s Third Law of Motion: For every action, there is an equal and opposite reaction. The more gas you give the car, the faster the wheels will turn. That is, the more force is pushing against the ground. The same force pushing against the ground pushes back against the car, making it move forward. Think about dropping a ball on the ground. The higher I am when I drop the ball, the higher it will bounce back up. The harder I bounce the ball, the higher it will bounce back up. Newton’s Third Law of Motion is at work every day in our lives. In thinking about opposite and equal reactions, a mirror comes to mind. When you smile into a mirror, what is reflected back at you? A smile. But what if you frown? Do you still get a smile? No. Whatever your face displays is reflected back to you in the mirror - it’s an equal face that is reflected back to you. It’s part of the law of the harvest. If you plant green beans, what do you expect to grow? Green beans. You don’t expect to plant green beans and then find radishes sprouting up a few days later. So you get back what you plant. It’s an equal and opposite reaction. You plant green beans; green beans grow. We’re getting ready to celebrate Thanksgiving Day this coming week. Why do we do that? Because God has given us so much. He’s given us His Son, life itself, the promise of eternal life with Him as his children. And we give thanks to Him because He is worthy to receive all of our praise and thanksgiving. He has given us so much!! Think about Newton’s Third Law of Motion. God has given us so much. What’s the equal and opposite reaction? We need to give thanks to Him. As the apostle Paul wrote to the church at Thessalonica: Give thanks in all circumstances; for this is the will of God in Christ Jesus for you. We’re choosing to nationally, collectively set aside a day to give thanks to God. But really, we should remember to give thanks to Him always! There’s a song that goes, “Oh, magnify, oh magnify the Lord with me, and let us exalt His name together! !” Maybe you’ve even sung that song. But have you stopped to think what it means to magnify the Lord or what it means to exalt His name? You’ve seen a magnifying glass. They are wonderful for making things bigger so you can see them better! Perhaps you’ve used one when you were looking at a bug. Or maybe your mom used one when she was trying to dig a splinter out of your finger. But is that what we’re supposed to do when we magnify the Lord? Are we supposed to make Him bigger? It’s not like making the bug or the splinter bigger, but magnifying God makes it easier for others to see Him. How would we make it easier for other people to see God? Maybe that’s where “exalt” comes in. Exalt means to lift up. So if I pick up your little brother, am I exalting him? No. Exalting doesn’t necessarily mean to lift up in a physical sense. That is, I’m not exalting the cookies when I hide them in a cupboard where the kids can’t reach them (although that doesn’t work anymore because my boys are taller than I am now). It’s not putting something up in a high place that exalts it. Exalting has the idea of praise and honor. It’s the idea in the song, “Lord, I lift your name on high.” We’re not just putting God’s name up close to the ceiling; we are praising Him and honoring Him. tell of his wonderful deeds. Talk to other people about the great things that God has done in your life. If you don’t know what God has done for you, ask your mom. She’ll have a whole list! sing songs of praise to God! When you sing songs of praise, you are joyfully telling how great our God is. give Him thanks. Psalm 69:30 says, “I will praise the name of God with a song, and will magnify him with thanksgiving.” When you thank God, you are giving Him the credit and honor and glory for what you have been given and the good things that have happened, and are happening, to you! magnify God in your actions. When you choose to obey God’s commandments, you are telling the whole world that God is greater than you. You are magnifying Him and exalting His name to everyone around you. Sometimes people think that they are merely supposed to be reflections of God’s love. It’s like shining a flashlight in a mirror. It shows back God’s glory and power and love. But what if we’re not only supposed to reflect God’s glory and love and majesty to everyone around us; what if we’re supposed to magnify God’s glory and love and majessty so they can see God better; what if we’re supposed to magnify Him through our words, our songs, our thanksgiving, and our actions. There’s one other really important part of this verse. We’re not supposed to magnify God and exalt His name by ourselves. Listen to it again: Oh, magnify the LORD with me, and let us exalt his name together! “Magnify the LORD with me and let us exalt His name together!! When we tell of what God has done, when we sing songs together, when we give thanks to God as a group, and when we all work together in our actions, we have a much bigger impact than when we’re just one person by ourselves. It’s like several magnifying glasses all working together. The big word is synergism and it means that together we make more of an impact - a stronger witness - than the impact we each make on our own by ourselves. So are you ready? Oh magnify, oh magnify the LORD with me, and let us exalt His name together!! Have you ever been blindfolded and led around a room or through a maze? Was it scary not being able to see where you were going? Did the amount of fear you felt depend on the person who was leading you? Absolutely! Someone you trust can lead you even when you are afraid. Sometimes people are blindfolded and led through obstacle courses. Sometimes the blindfolded person is not led by the hand; they are guided only by someone’s voice. Do you think that would make the activity more or less scary? I am terrified of heights, so afraid that I cannot make myself move when I am overcome by that fear. Unfortunately that happened last year as we were walking along the rim of the Grand Canyon. I’m okay when the trail is asphalted or concrete. But when the trail is gravel and I can easily envision the gravel rolling under my feet, I become terrified. At one point, Ron came and took me by the hand. If he hadn’t led me, I don’t know that I would have been able to move. I was afraid to go forward and afraid to retreat - and that was without the blindfold. I can only imagine my terror if I hadn’t been able to see. So when we read in 2 Corinthians 5:7, for we walk by faith, not by sight, I have an idea of what that might look like. We live our lives according to what we believe about God, not according to what we see around us. We believe that God commanded the Sabbath and the Holy Days to be kept. So we keep them. We believe God commanded us to abstain from unclean meats, so we watch what we put in our mouths and stay away from unclean meats. We believe that God doesn’t want us to steal, so we don’t take what doesn’t belong to us. We believe that God abhors liars, so we are careful to speak the truth in love. We believe that God is - and that He rewards those who diligently seek Him. We believe that having a relationship with God is more valuable than anything in this world. Our belief is so strong that it overcomes our fear that is a natural part of walking by faith. Some people don’t have faith strong enough to be able to follow God: they are afraid that people will make fun of them; they are afraid that they could lose their job; they are afraid of being different from others; they are afraid and think that maybe it just doesn’t matter. Their fear keeps them from doing what pleases God. Our faith in God, our belief in what He has done and what pleases Him, dictates our actions. It changes us more and more into the image of Jesus. And it makes us less and less like the world around us. We act less like the things we see. We act more like what we believe about God. You know, I didn't believe that I could walk along the rim of the Grand Canyon safely. I let Ron take me a little ways, but the path wasn’t wide enough for both of us. Even thinking about it now makes me tense. I didn’t have the faith that I would be safe - and I missed out. I wasn’t able to go to the end of the path to the overlook to see the incredible creation of our Creator, one of the seven wonders of the natural world. I missed out. In a similar way, those Christians who don’t walk according to the faith that God has given them, who fail to walk in a way that pleases God, miss out. The other day I went downstairs to get a jar of tomatoes. I found my turmeric tubers had sprouted. I had to do something with them. Have you ever left potatoes sprouting until the growing potato has sucked all the nutrients out of the tuber? The potato is just left, wrinkled and shrunken and not much good. If I just left the sprouted turmeric in the bag, the same thing would have happened to them. So. What do you think I did with the turmeric? Ron planted it. What do you think he planted it in? It was a mixture of soil and sand. Then I added water. Why did Ron plant the sprout in soil? That’s how God has designed plants: most plants grow best when they are rooted in soil. It doesn’t work very well to plant them on the concrete or in a toy box or in a jar of marbles. Plants need the nutrients from the soil to help them grow strong and healthy. Concrete and toy boxes and marbles don’t normally have the nutrients that plants need. You get this. You’ve been around plants enough to understand how this works. As plants take nutrients and water from the soil, the roots continue to grow down and the stem and leaves grow up. If it was only the stem growing up, without the growing of the roots, what would happen to the plant? It would fall over. It’s very important to the stability of the plant that the roots continue to grow down and out to provide the foundation for the plant. Sometimes plants grow a single taproot down - like a carrot. Other times plants grow a bunch of hair-like or finger-like roots - like grass or corn. So in Ephesians 3:17 when the apostle Paul says “rooted and grounded” is he talking about plants? No, we know he isn’t because of two things: First, he says “rooted and grounded.” The first word is a biology word and has to do with plants. The second word is an architectural word which has to do with the foundation of a building. Then Paul says, “that you, being rooted and grounded . . .” He’s using the plants and buildings - something you are familiar with - to make a point. You need to grow and develop in the place where you have the things to you to help you grow strong and healthy. What kinds of things make you strong and healthy? Where do you get those kinds of things? Paul gives us another really good clue when he says we are rooted and grounded in love. Who loves you more than anyone else? Your parents love you! They give you the things (food, clothing, shelter, and yes, rules) that you need in order for you to grow strong and healthy. Think about the choices that your parents make so that you will grow strong and healthy. You have good food to eat (not a bunch of candy and junk). You have warm clothes to wear when it’s cold. They are teaching you about God, His love for you, and His ways so that you’ll make good choices. They want you to have a good foundation for making choices even if they aren’t around. If they didn’t love you, they might root you in candy and junk food, throw dirty clothes with holes in them for you to wear, and let you do whatever you want. It’s because your parents love you that they give you good things - including rules - and make sure you are firmly grounded in obeying those rules. It’s interesting, really, because our parents help us to understand that our Heavenly Father, God Almighty is the One who gives us what we need: remember the verses about the birds of the air and the lilies of the field (Matthew 6:25-33)? And guess what? God gives us what we need because He loves us. In other words, we are rooted and grounded in love, God’s love. O.K. So back to the plant. Once that plant is rooted in the soil, what does it do? It grows and produces something. A plant might produce tomatoes or turmeric. It might grow apples or walnuts. All plants take in carbon dioxide and release oxygen - which we need in order to live. And some plants filter the air, taking the dirt out of it, better than others. And then think about the foundations of buildings: if a building has a bad foundation, what happens when storms come? What happens when something shakes the building? It could easily collapse. So what about you? Being rooted and grounded in love, growing strong and healthy the way God wants you to, having a solid foundation on His word, what do you produce? The most important thing you produce is love for your parents. And you show that love by obeying them. What good is it to go give your mom a big hug and tell her you love her and then break all of her rules? Your words don’t mean much if you don’t obey her. It’s the same thing with God. God has given you all things. He’s rooted and grounded you in love so that you’ll grow strong and healthy. So what is your response to Him? The reasonable response is to love Him with all of your heart (Rom 12:1, Deut 6:5). And how do you show that love? By obeying His commandments (John 14:15). What good is it to say that you love God with your words and then tell Him you don’t love Him by breaking His laws - laws that were given for your good?! I have some very happy, healthy turmeric plants because they were rooted in soil. And you are happy and healthy because you are rooted and grounded in your parents’ love and in God’s love. Praise God!! Magnets are fascinating: the attraction, the repulsion, their movements because of that force. No matter what you do, the magnets are going to steadfastly act on that force of attraction or repulsion. They don’t suddenly change their minds. They don’t switch. They are either attracted or they are repulsed. Period. I couldn’t help thinking about the decisions we make every day. There are behaviors which absolutely repel us. We can’t even think about doing those things because they are so repulsive. Stealing. Murder. Lying. How do we get to the place where these things are repulsive? It starts with our parents. Parents have a huge responsibility to teach their children right from wrong. They are the ones who help their children understand what is attractive and what is repulsive. So it’s a really good idea for your parents to love God and to read the Bible. Do you know why? God tells us what pleases Him in the Bible. It’s His instruction manual to us. And because God is our Creator, He gets to decide what is right and wrong. And yes, He does care what we do. He wants us to do what is right, to choose to live our lives His way. So He gives us parents. We rarely start out doing what our parents want us to do. We are rarely repulsed by the wrong. They have to teach us - usually through some sort of punishment if we’re disobedient - until we get to the point that we avoid the wrong. We don’t want the consequences. But eventually, their teaching becomes part of who we are and we are completely repulsed by wrong. For instance, to my knowledge, I’ve never eaten shrimp. I see commercials about it on television and it almost makes me nauseous to think about putting nature’s garbage disposal in my mouth. I know that eating clean food is part of God’s law, but it’s now so much a part of who I am that I am automatically repulsed by even the thought of it. God works with us every day in the choices we make. As long as we continue to choose the right, the wrong becomes more repulsive. Eventually we can’t make ourselves do the repulsive thing because it’s so repulsive to us. That’s why you don’t ever tell yourself that breaking God’s law “just this once” is okay. If it’s okay once, then you’ll tell yourself it’s okay twice. And pretty soon, breaking God’s law is no longer repulsive to you. You suddenly find yourself apart from God and His goodness in your life. How do you avoid that temptation to say “just this once?” You listen to your parents and obey them. You read the Bible. You hold a firm line. If your conscience tells you it’s wrong, don’t do it - not even once. As you continue to make the right choices, it becomes part of who you are until the wrong is repulsive. But it starts right here, right now - you have to listen to and obey your parents. God put you into their care to teach you His ways. So today you are building your attraction to God’s ways and your repulsion to sin. Don’t try to convince yourself that God will excuse your sin. God sent His Son to die to pay for your sin. He doesn’t take it lightly. It’s your job to abstain from every form of evil.